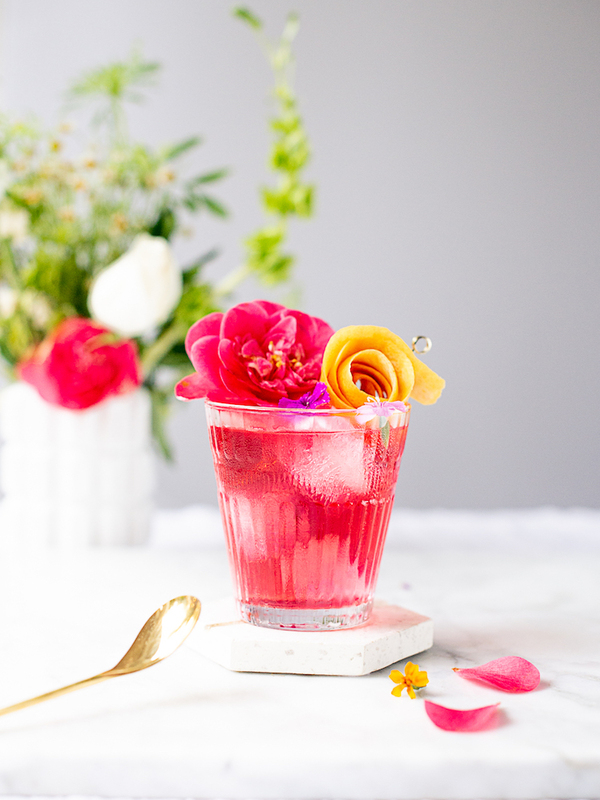 Craft & Cocktails is devoted to the art of making & shaking focusing on original, seasonal & approachable cocktails to make at home.I'm Ashley Rose Conway, a cocktail shaker and piñata maker. 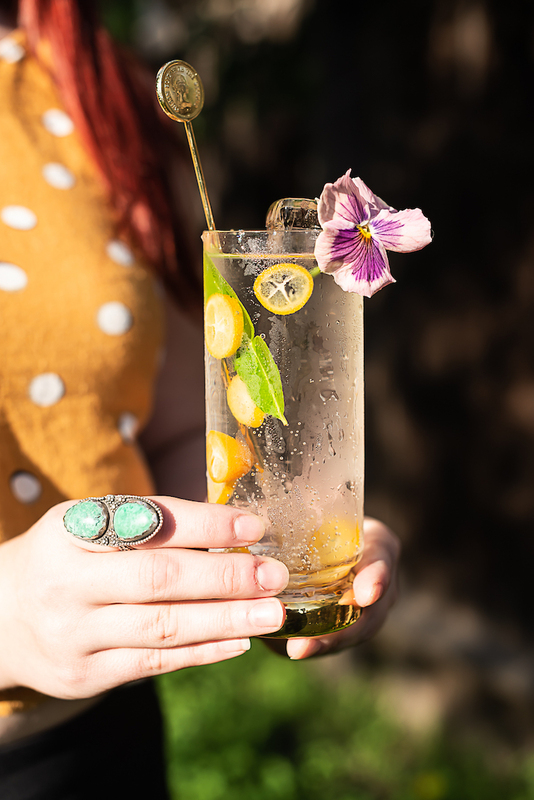 I am always in the pursuit of fun and the perfect drink. 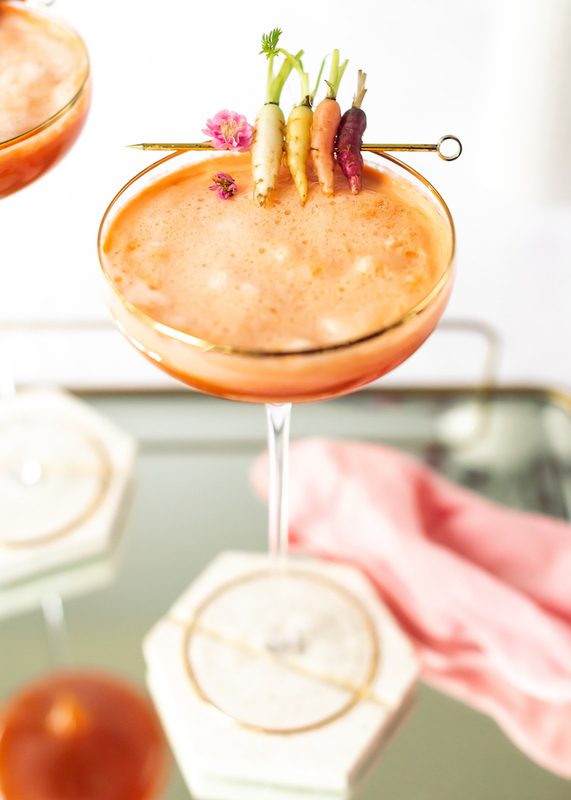 I work developing recipes, styling, and photographing cocktails as well as creating stories around libations, celebrations, and entertaining. 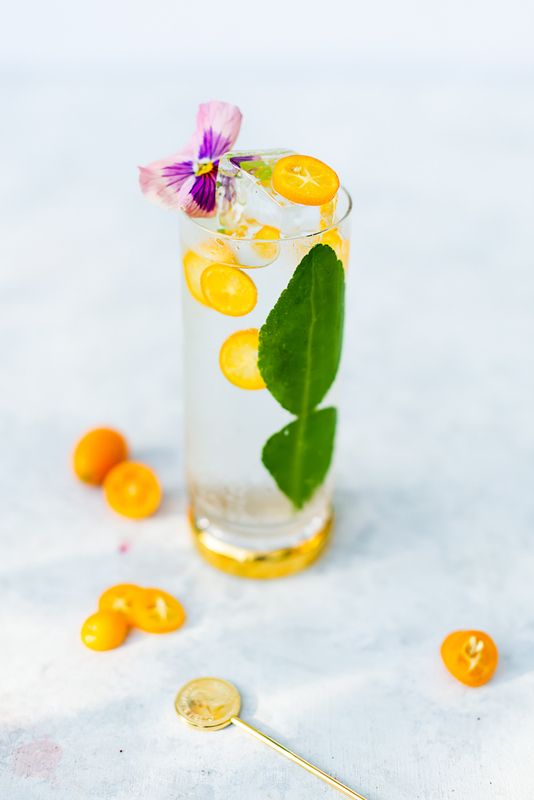 The post Kumquat Makrut Lime Spanish Gin & Tonic appeared first on Craft and Cocktails. 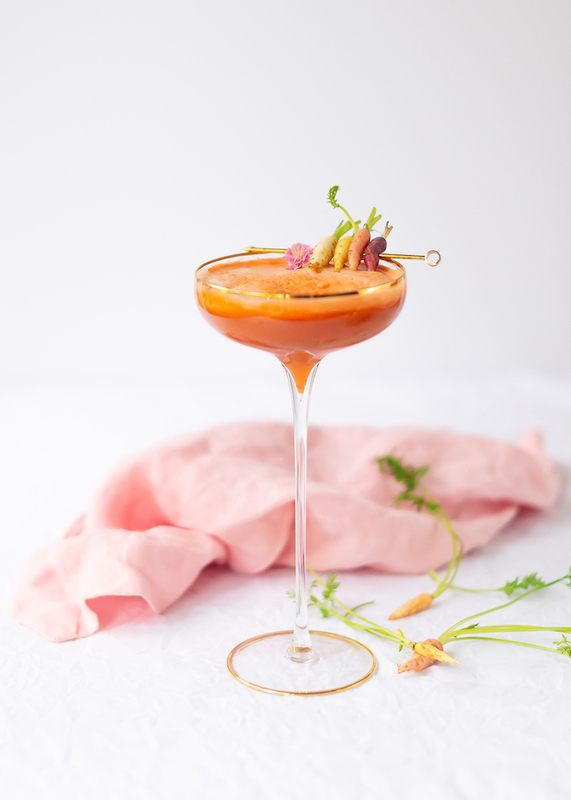 The post 24 Carrot Cocktail appeared first on Craft and Cocktails. 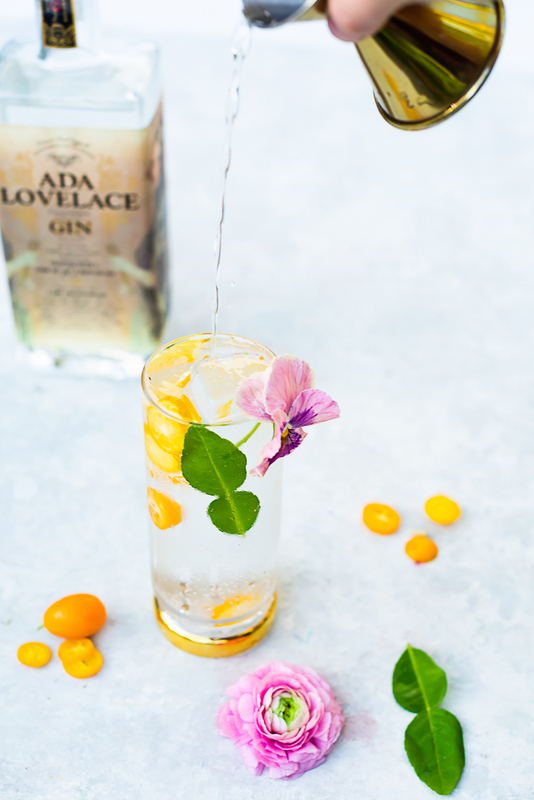 I am honored to be featured along side some other amazing women in the world of spirits writing and photography on Women & Whiskies to celebrate International Women’s Day and Women’s History Month! 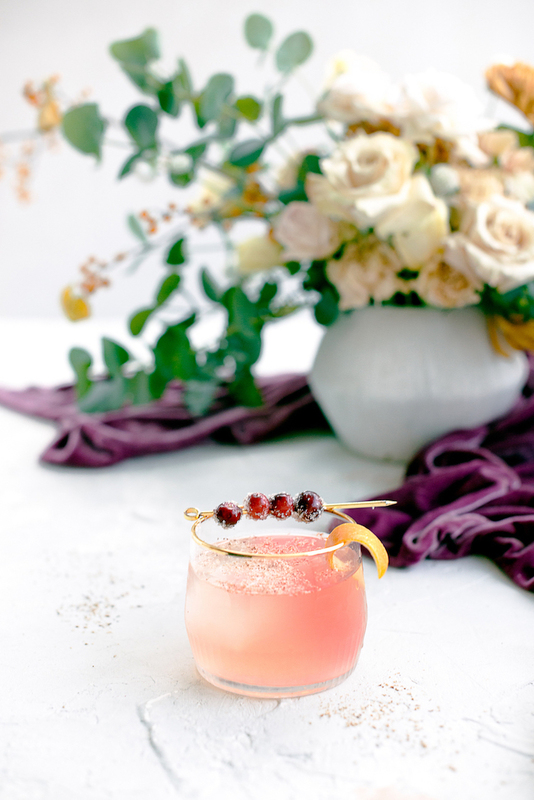 I created the Women’s Equal-TEA cocktail to pair with my feature. Although a cute name, it is inspired by the struggles and efforts of women fighting for equality among all genders. Whether the pink tax, unequal pay, secist policies, and reproductive rights (just to name a few! ), women face inequality everyday in one form or another. Women & Whiskies has been a great program and community that has embraced women like me into the world of whisk(e)y that was for a long time, exclusionary of ladies either with advertising, tastings, or the culture surrounding it. 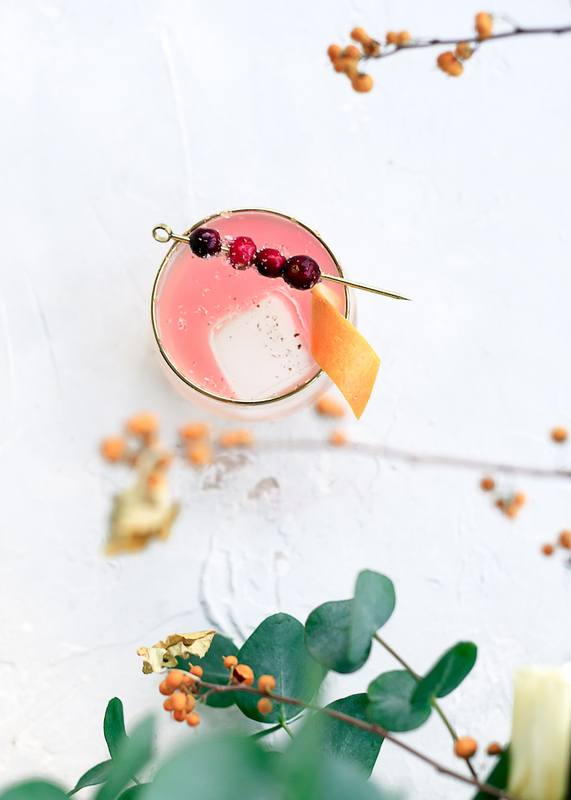 W&W created a space and site for women to come together to taste without pretension and learn about this beautiful category of spirits without fear of judgement. Whiskey is no longer a men’s spirit (because honestly how can a spirited be assigned to a gender?! ), but also a women’s. 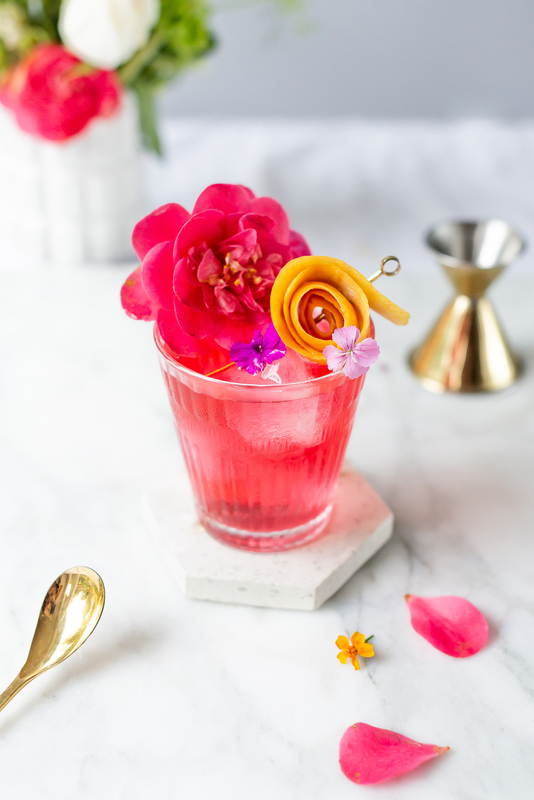 The Women’s Equali-TEA cocktail features hibiscus rose tea that is both sweet but tart, bourbon for a kick, and ginger that will bit back. They all play well together in this complex yet easily likeable whiskey sour .You can also get the recipe here along with other amazing whiskey cocktail recipes included these developed by some of my favorite women in the spirits world Arsenic Lace’s Campari spiked The Future is Female & Gastronomista’s cherry blossom and scotch gem. Cheers to ALL women today and everyday! 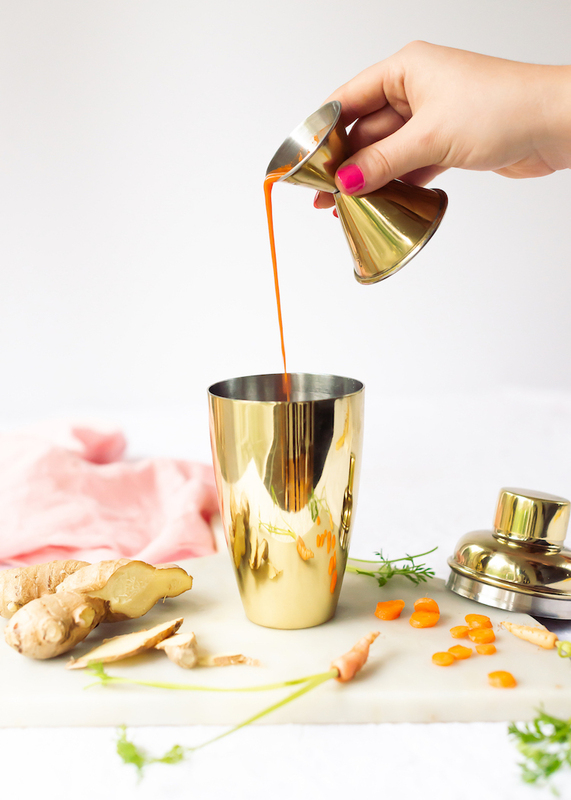 Muddle ginger in a shaker tin. Add the bourbon, tea, lemon, simple syrup, and bitters to the shaker. 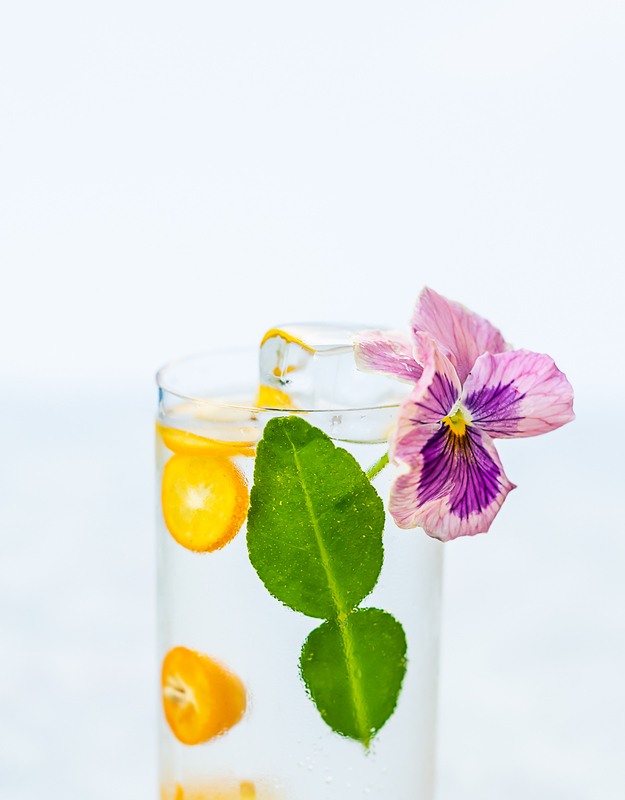 Shake with ice and strain into a rocks glass with ice. Peel a long lemon peel. Express lemon peel over the glass. Roll the lemon peel up to form a “rose”. 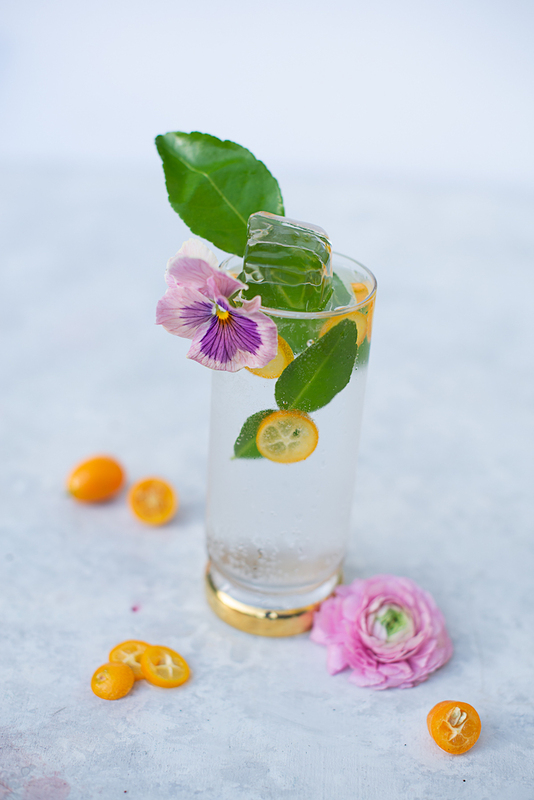 Garnish glass with peel and edible flower or rose. 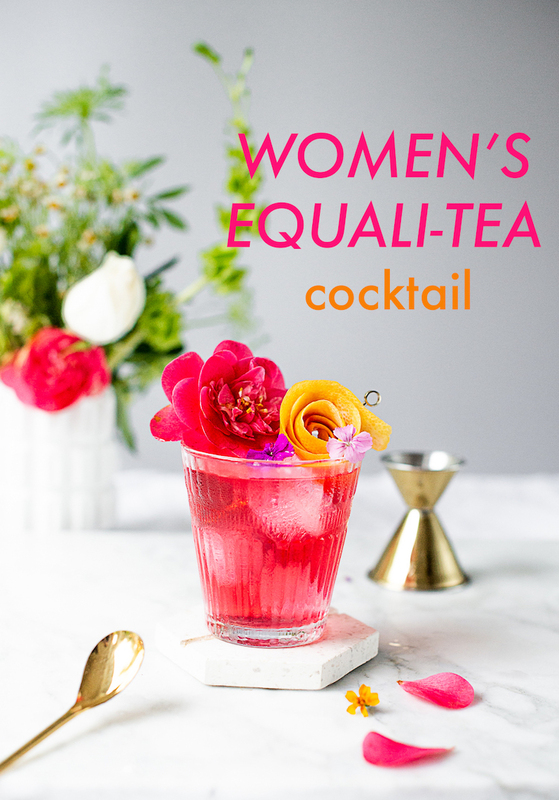 The post International Women’s Day & Women’s Equali-TEA Cocktail appeared first on Craft and Cocktails. 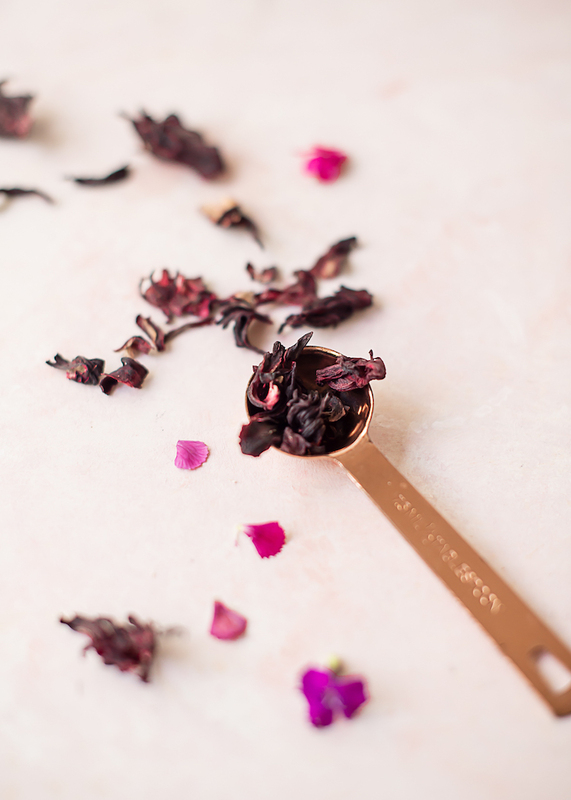 Hibiscus is one of my favorite tea ingredients. Not only does it have a vibrant fuscia color, but it a Hibiscus flowers have a tongue tying tartness you wouldn’t expect from a flower. 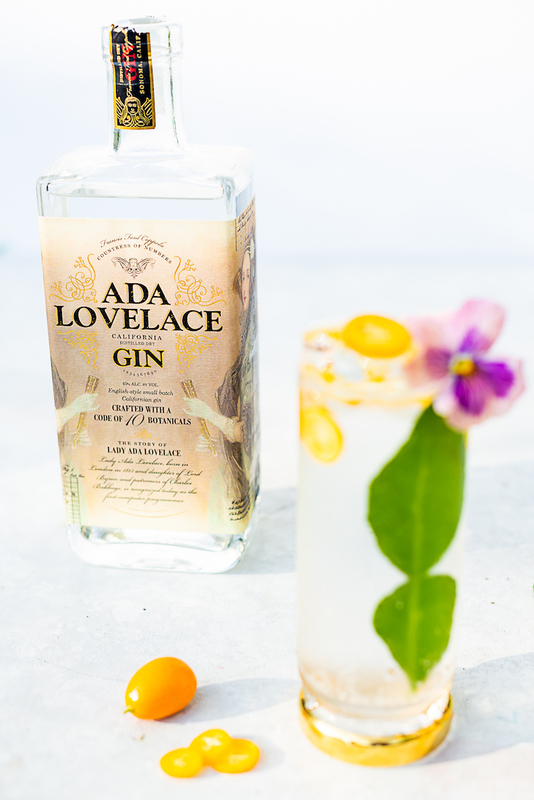 There is a moment of anticipation after the first sip of an impending citrus bite to come in on the finish with the accompanying tartness, but instead your get subtle floral notes. 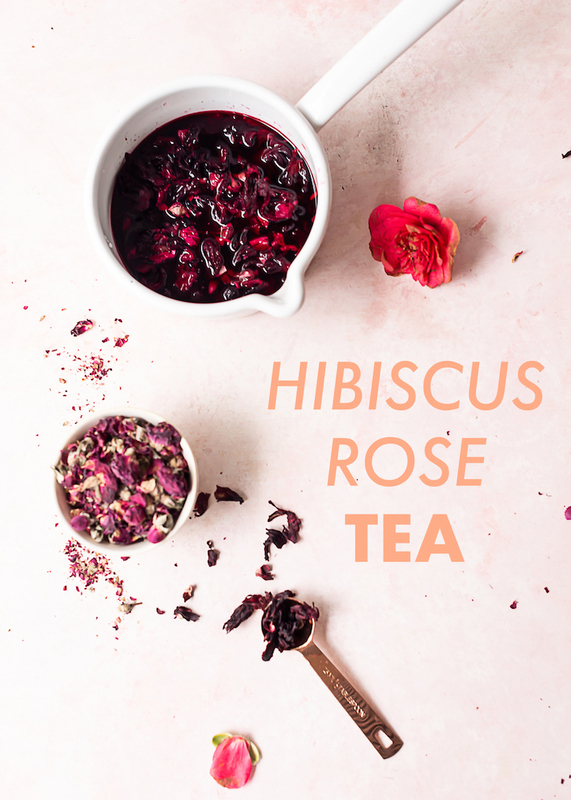 Hibiscus tea is wild ride. 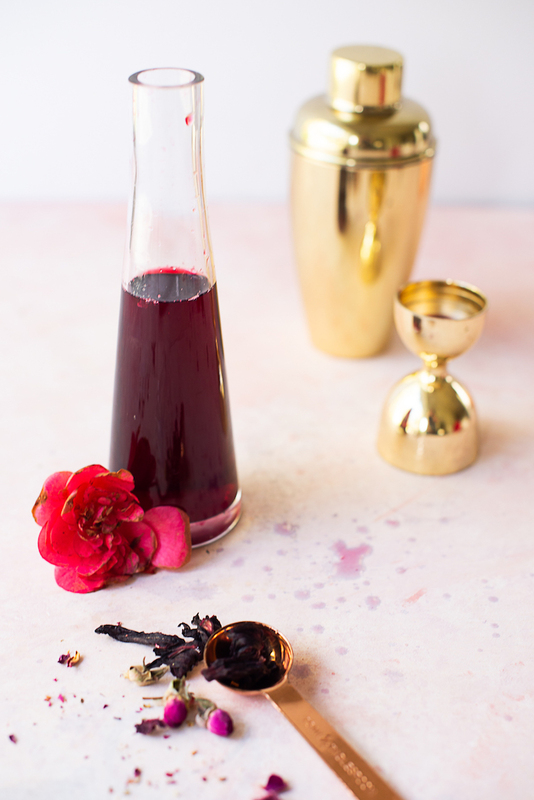 I added rose to the hibiscus tea to accentuate the floral notes to create this hibiscus rose tea that is perfect for mixing into cocktails like the Women’s Equali-TEA. 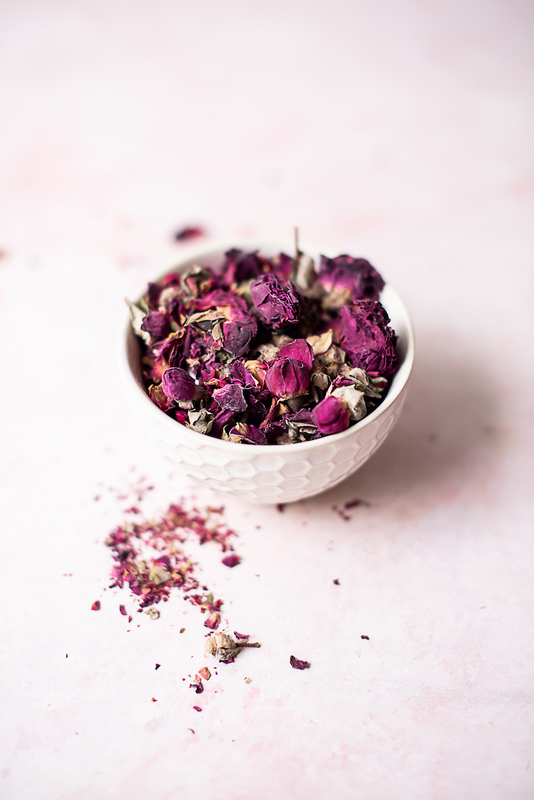 This tea is concentrated, meant for adding into cocktails to add a lot of flavor. So if you are going to drink this on it’s own, add a bit of water to taste! In a saucepan, and water and bring to a boil. 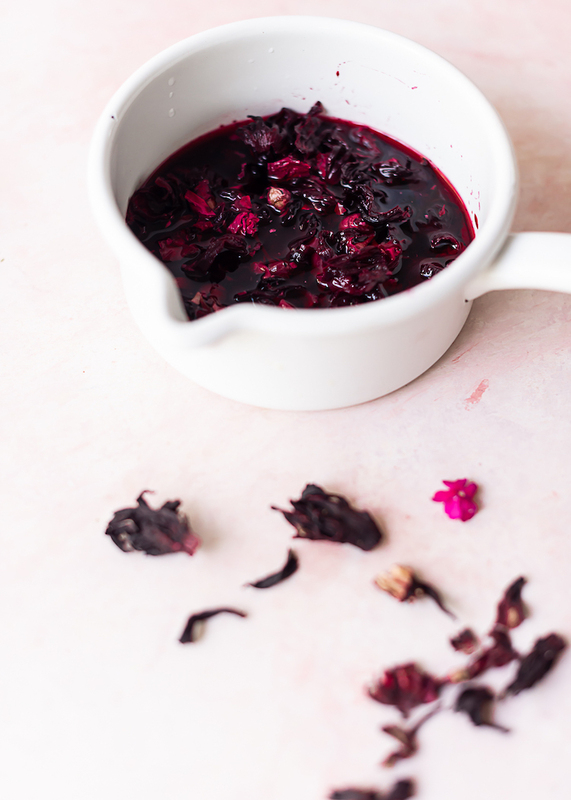 Remove from heat and add the hibiscus and rose petals. Stir well. Let steep until cool. Strain out the flowers into a jar and store in the fridge for up to a month. 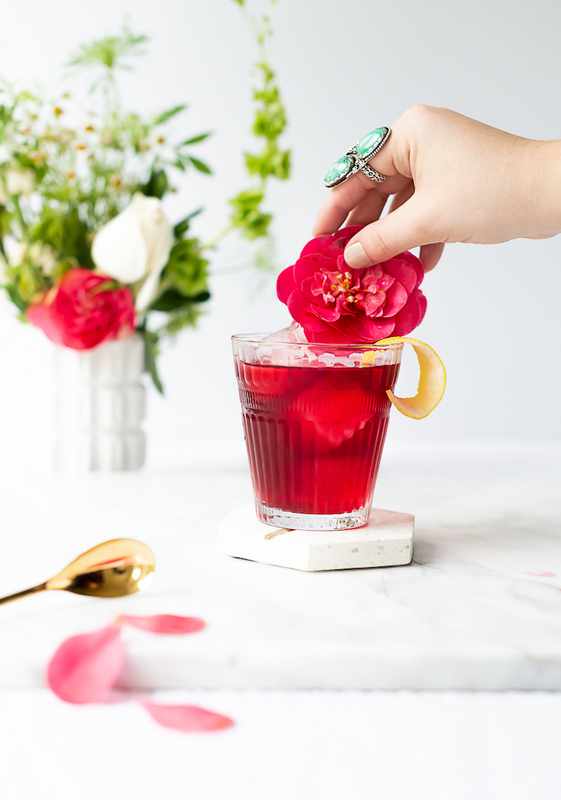 The post Hibiscus Rose Tea appeared first on Craft and Cocktails. The golden landscape of Northern California has given way to lush, rolling hills ranging from emerald to chartreuse to celery to the most vibrant green apple with all of the winter rain we have been getting. 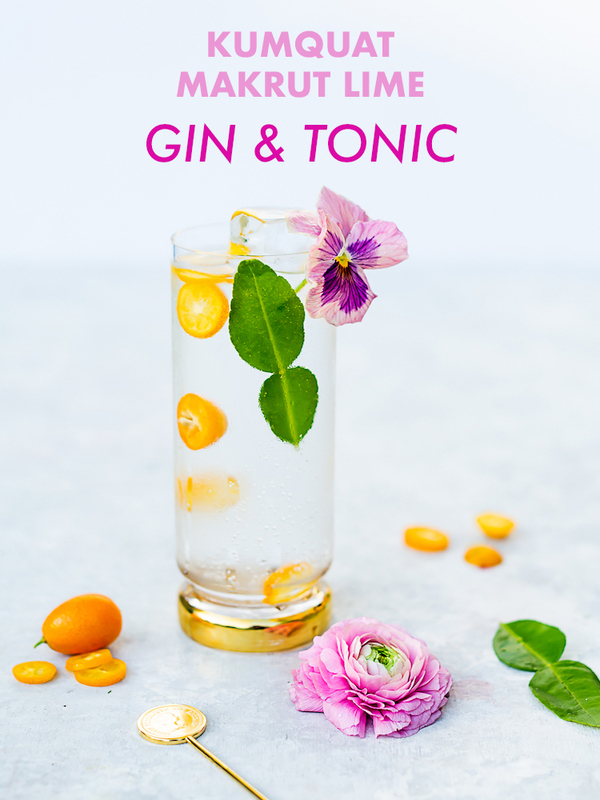 Sounds like the perfect cocktail! 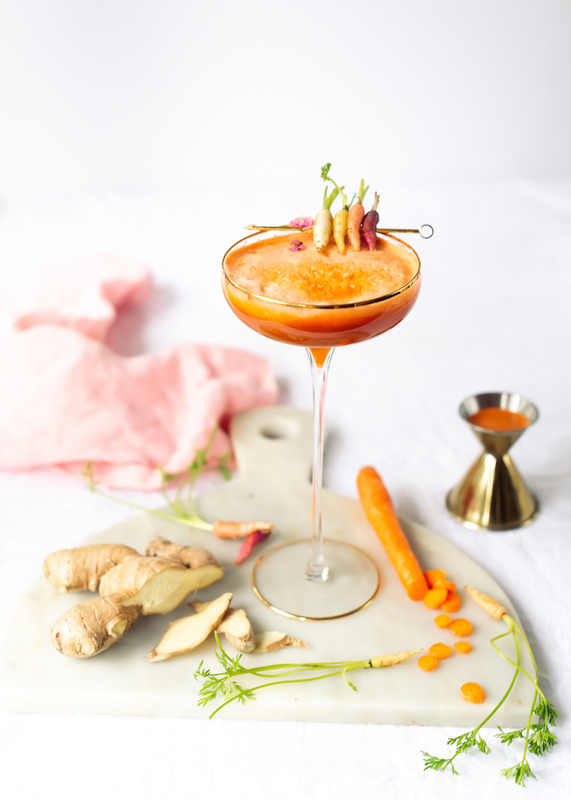 These magnificent colors inspired this savory tipple, and I also included a spirit-free/mocktail version for those who are abstaining. 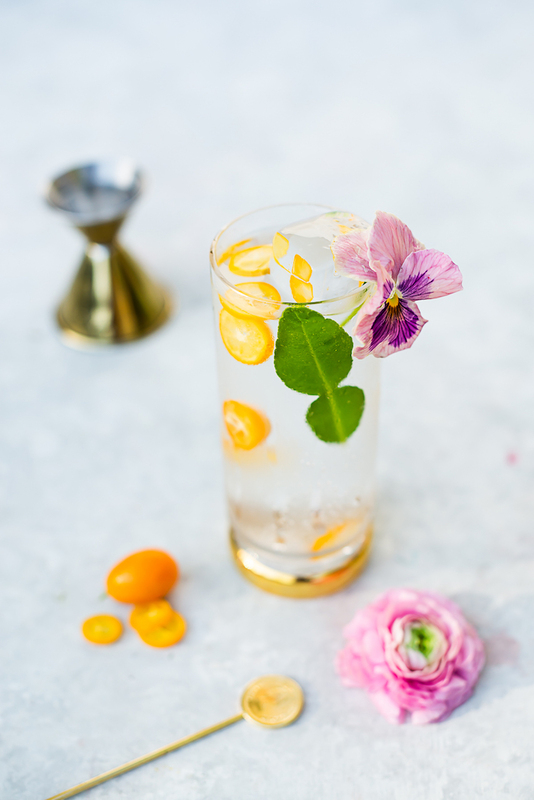 Spirit-free options are one of the most requested type of drinks from you all. We can’t drink cocktails everyday after all, we need tasty options for when we are not imbibing. 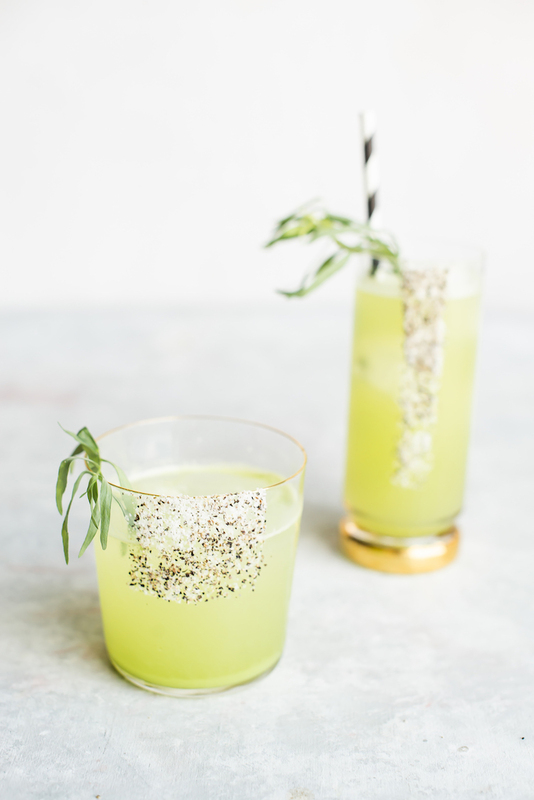 This Here Today, Tarragon Tomorrow cocktail, all puns aside, is a great tipple to sip as we transition into warmer, sunnier days that are on the horizon…or I at least hope they are! Here Today, Tarragon Tomorrow is a savory cocktail, and spirit-free drink, that have wisps of spring woven through out. 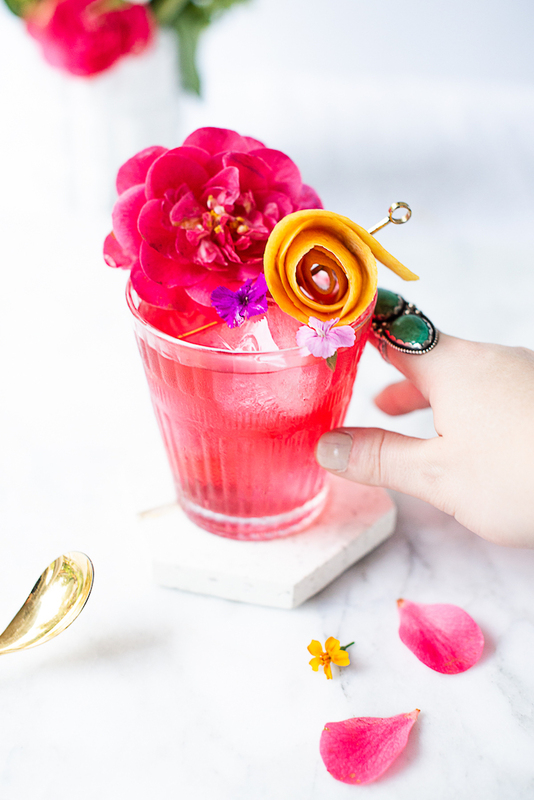 The first sip of the cocktail reveals the tart green apple bit that pirouettes with the earthiness of the tequila beautifully. 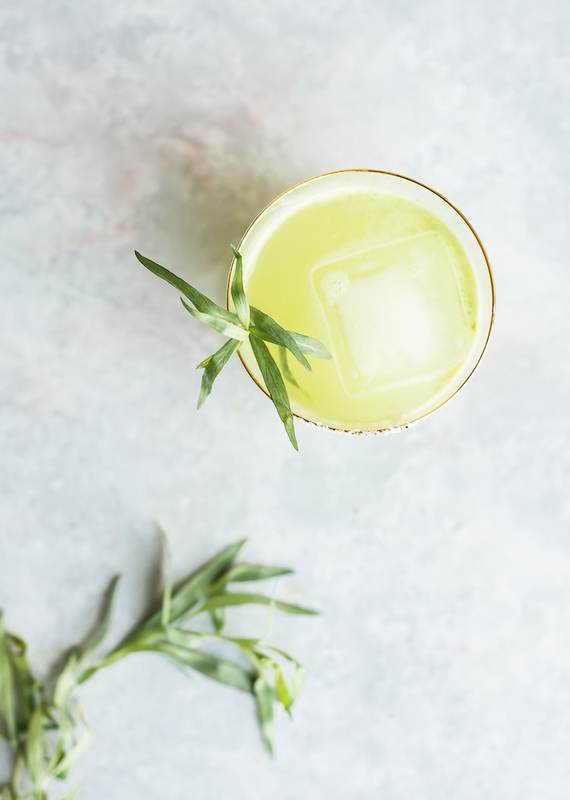 Upon further exploration, the subtle anisette in the tarragon reveals itself while picking up on the tequila’s notes. 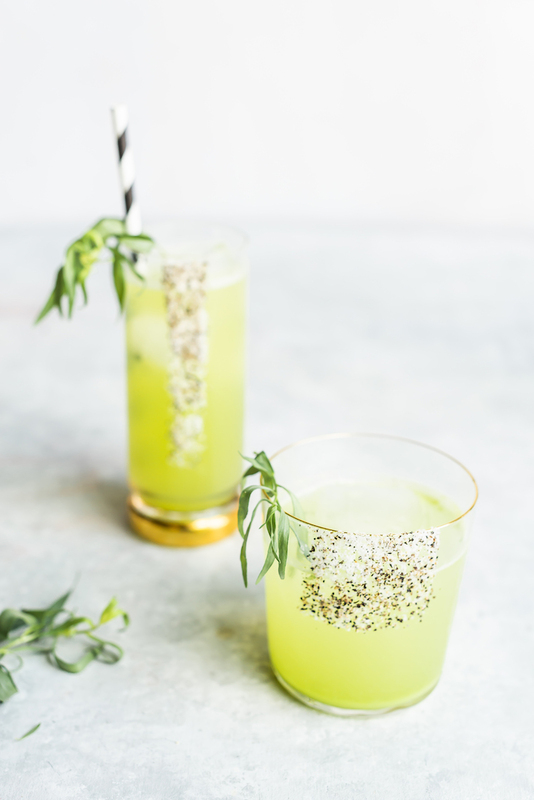 The celery salt rim adds a dynamic although unusual flavor component that works with all of the fresh, green notes in the vibrant (and spirit-free) cocktail. 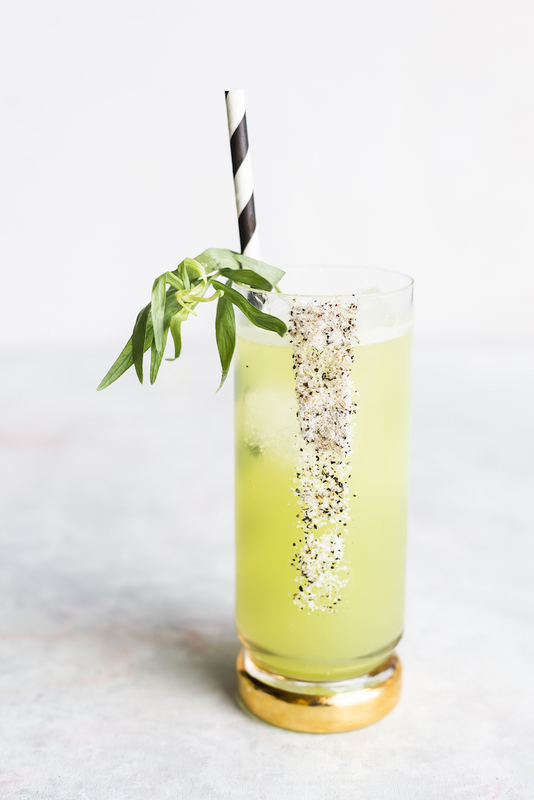 The spirit free drink omits the gin and adds soda water for fizz to elevate the tarragon syrup and green apple. Fell free to add the spritz of chartreuse to add complex herbal notes with out adding ABV. 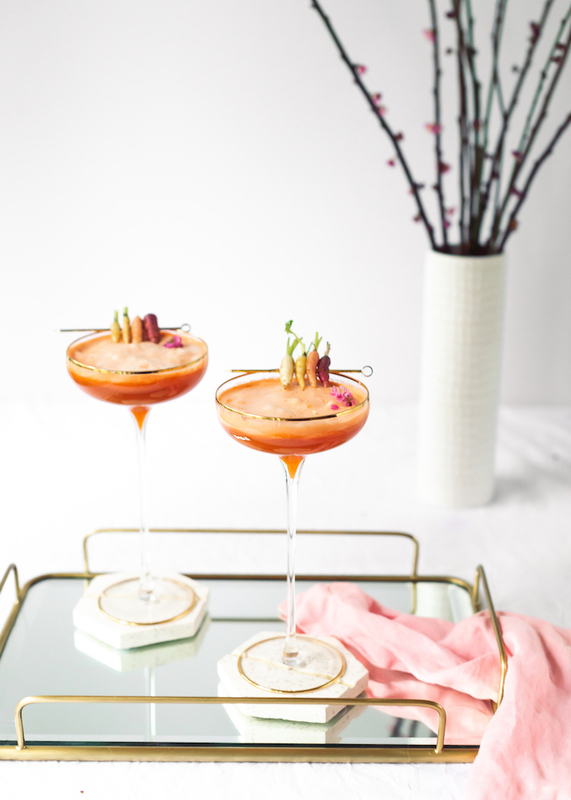 These drinks are variations I made for my classes with Macy’s last year! It was fun to demo these and server them to a crowd. I was back in my element of teaching! 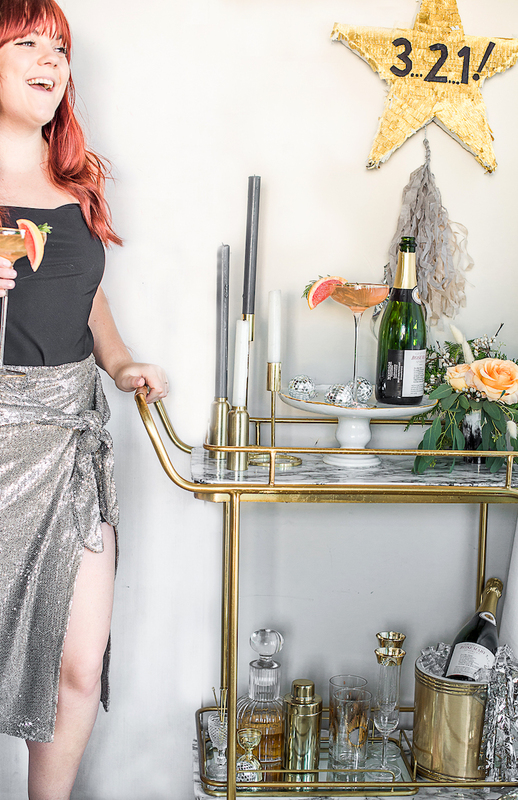 I definitely plan to teach more cocktail classes this year to bring more cocktail knowledge, and beverages, to you IRL. Add 4 tsp celery salt to 2 tablespoons coarse salt on a plate. Using a lime wedge, wet the rim of a rocks glass. Dip the rim of the glass into the salt mixture to coat. Add ice to the glass. Shake tequila, apple juice, lime juice, and tarragon syrup in a shaker with ice. Strain into the glass. 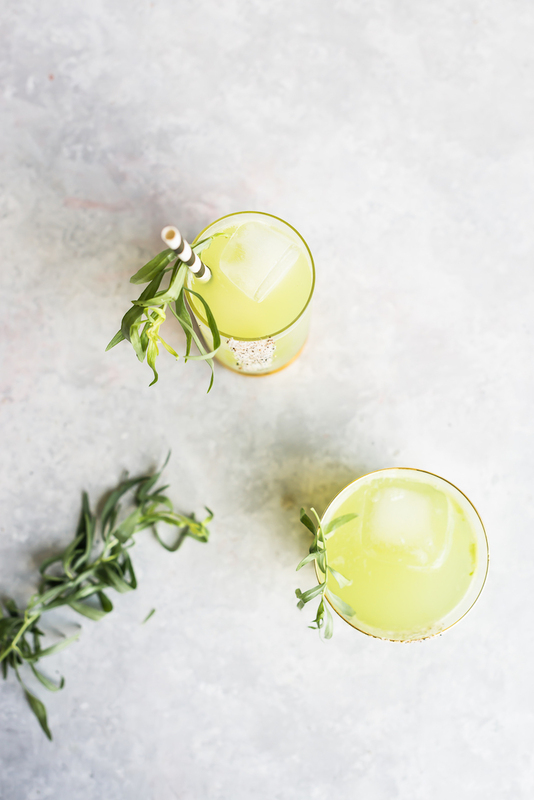 Spray with an optional spritz of Green Chartreuse (or rinse glass with it before straining the drink into it) Garnish with tarragon sprig and apple slices. 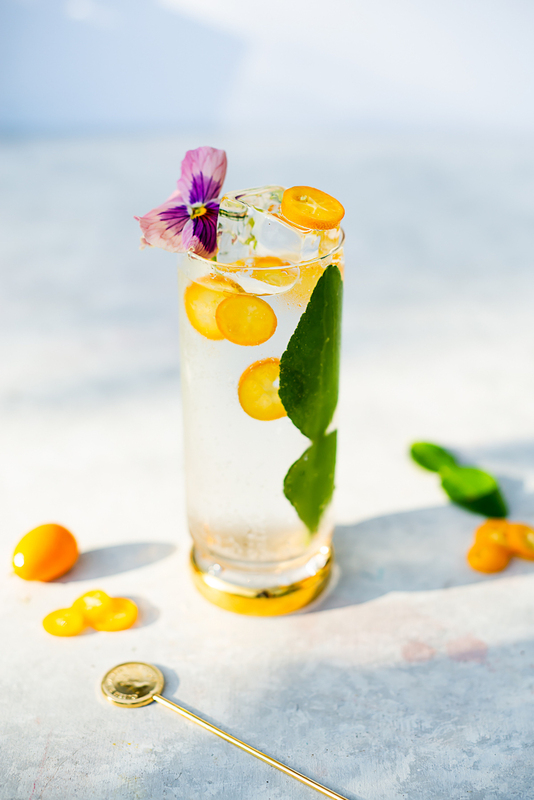 To Mocktail or Not to Mocktail? Add 4 tsp celery salt to 2 tablespoons corse salt on a plate. Using a lime wedge, wet the rim of a collins glass. Dip the rim of the glass into the salt mixture to coat. Add ice to the glass. 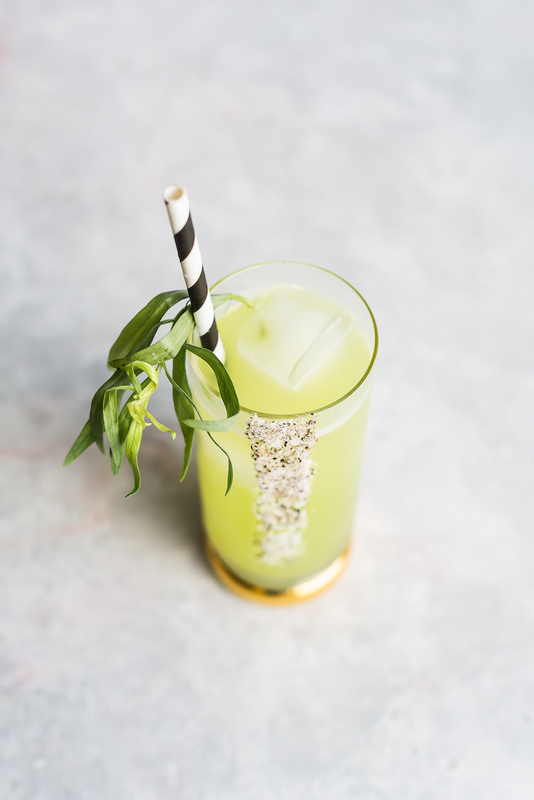 Shake apple juice, lime juice, agave, and tarragon syrup in a shaker with ice. Strain into the glass. Top with club soda and stir. Spritz Green Chartreuse over the glass. 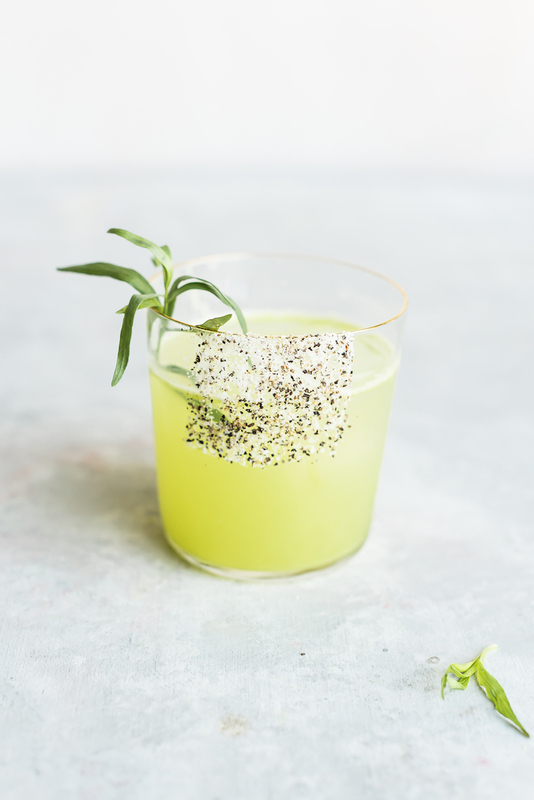 Garnish with tarragon sprig and apple slices. 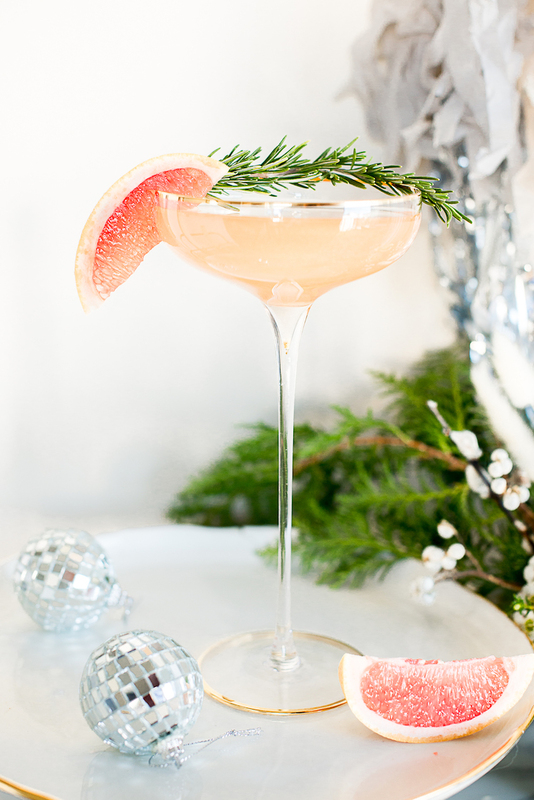 *Spritz of Green Chartreuse will add a very, very minimal alcohol to the cocktail, but a lot of flavor. Add sugar, water, and tarragon sprigs to mason jar or sealed container. Shake for 30 seconds. Let sit and shake periodically for 2-3 hours or until the sugar is dissolved. 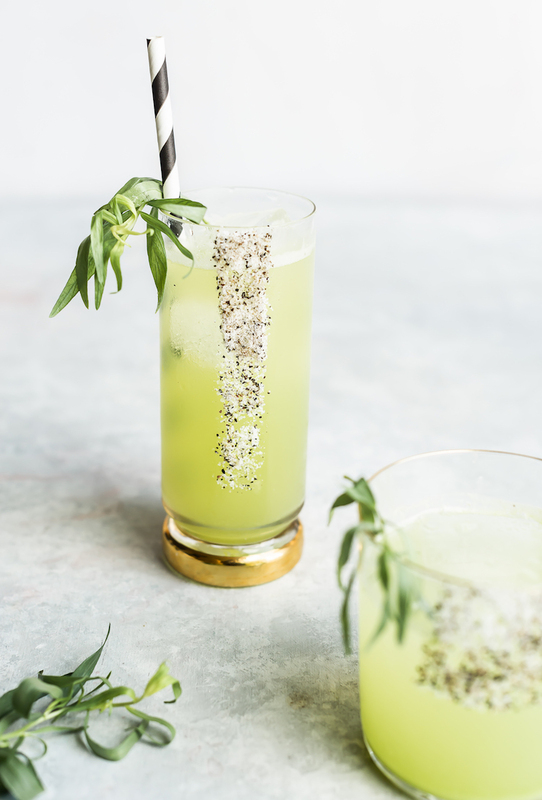 The post Here Today, Tarragon Tomorrow Cocktail & Mocktail appeared first on Craft and Cocktails. The holidays are here, and I could not be more excited! 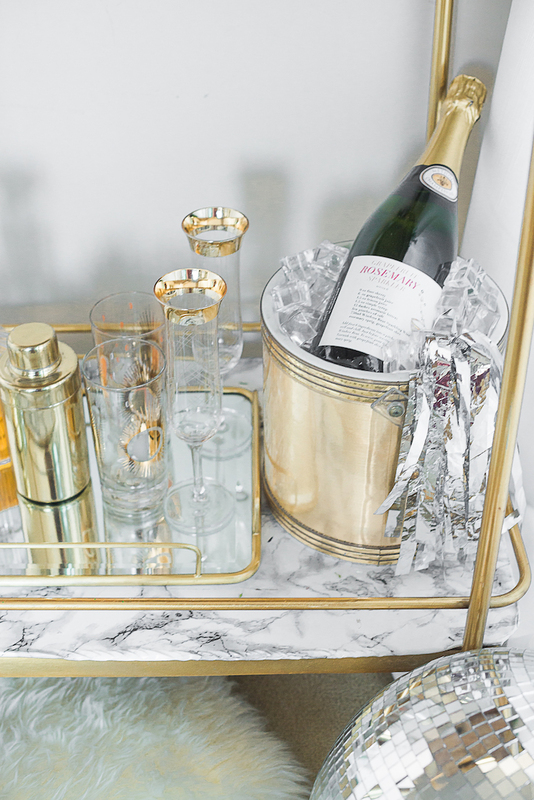 Time to decorate the bar cart, mix up some eggnog and start chilling the bubbly! 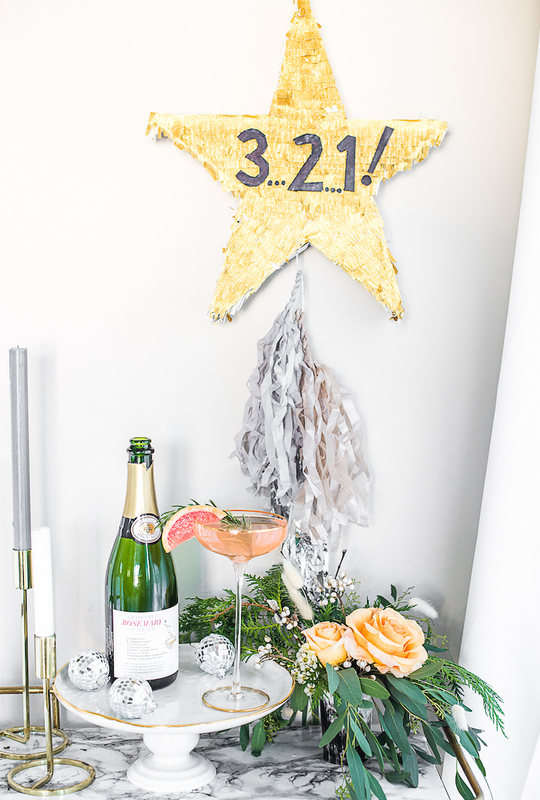 This year, I am helping host a New Year’s party to toast to 2019 as it rolls in. I am looking forward to a bit of a reset, reflection, and planning for the new year, lots of great things are on the horizon. I am also ready for all of the sparkle on New Year’s Eve! It is the one time of year I pull out all of the sparkly stops. Confetti? Check! Sequins? Check! Gold bar ware? Double check. And of course, some fabulous sparkling wine is a must! My Windsor Vineyards Brut is chilled and ready for a midnight toast. I only recently discovered Windsor Vineyards and their fantastic bubbly, but they have been in the wine making biz here, starting in Tiberon, California for a long time. They are the top three most award-winning wineries in the U.S. for over 60 years and are part of the Vintage Wine Estates. One of my favorite parts of #WindsorVineyards though: custom wine labels! Genius! I am already dreaming up all of the fun designs to make as labels for unique gifts. Rodney Strong, the original founder, used to have so many requests from people to set aside their favorite wines that he would put their names on them. From this grew their tradition of customized wine labels. We can all thank him for thoughtful, effortless gift giving! If you haven’t heard of Windsor Vineyards, be sure to check out their website and see all the ways you can customize you wine, and be sure to keep reading for a special offer code! 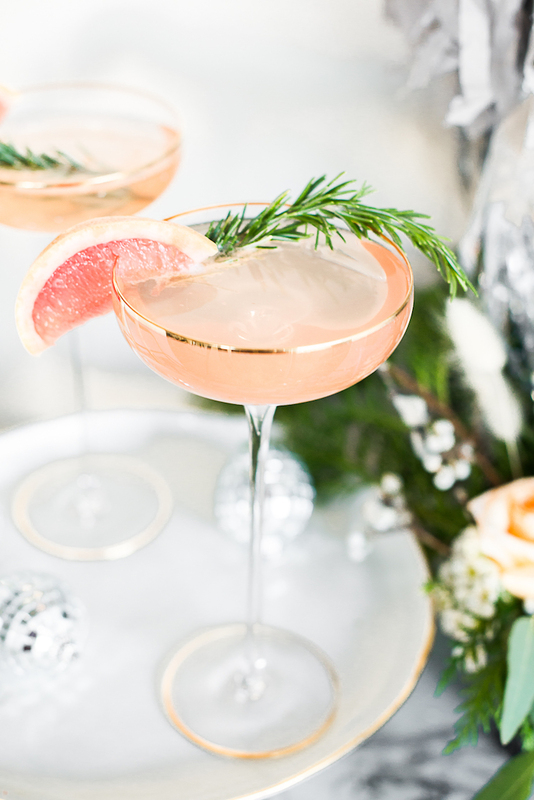 I mixed up a Grapefruit Rosemary Sparkler for a NYE Cocktail to serve as a fresh and bright drink to ring in 2019. 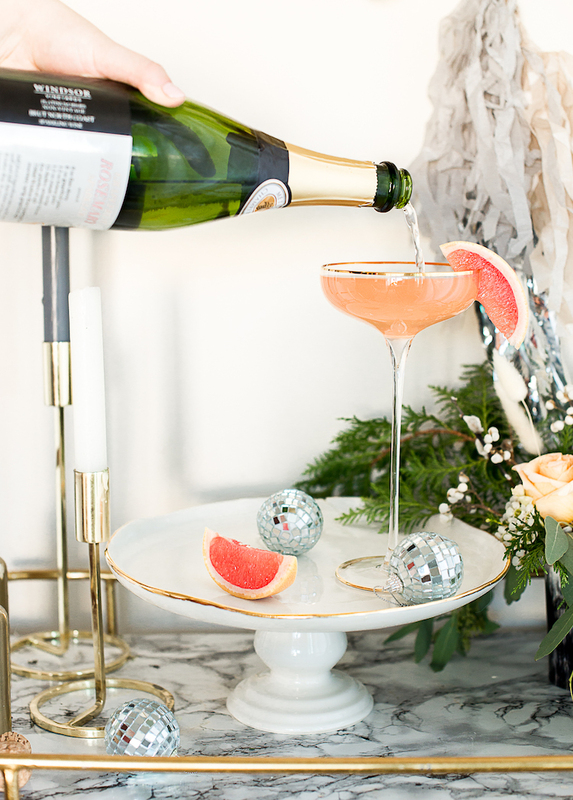 Grapefruit and sparkling wine are a match made in drink heaven. 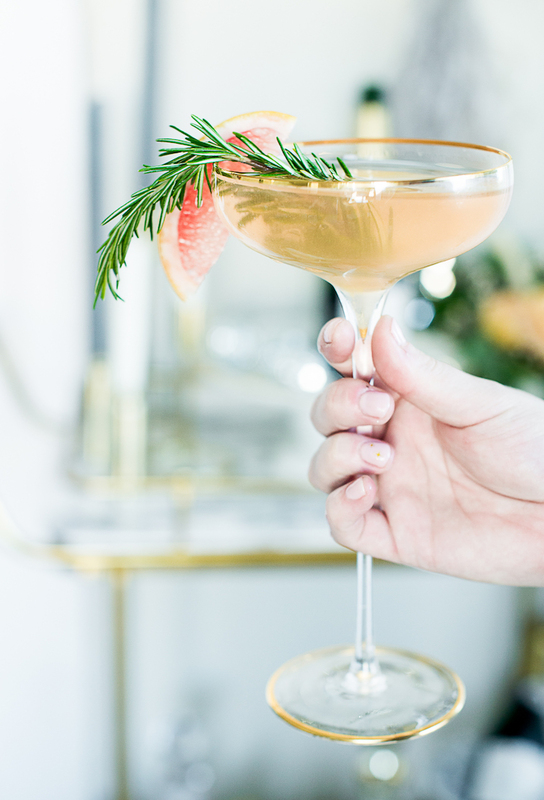 I combined fino sherry that’s dry which also works phenomenally with grapefruit and the rosemary garnish which lends woody herbal notes to the drink. The Windsor Vineyards Brut finishes it all off beautifully with effervescence. 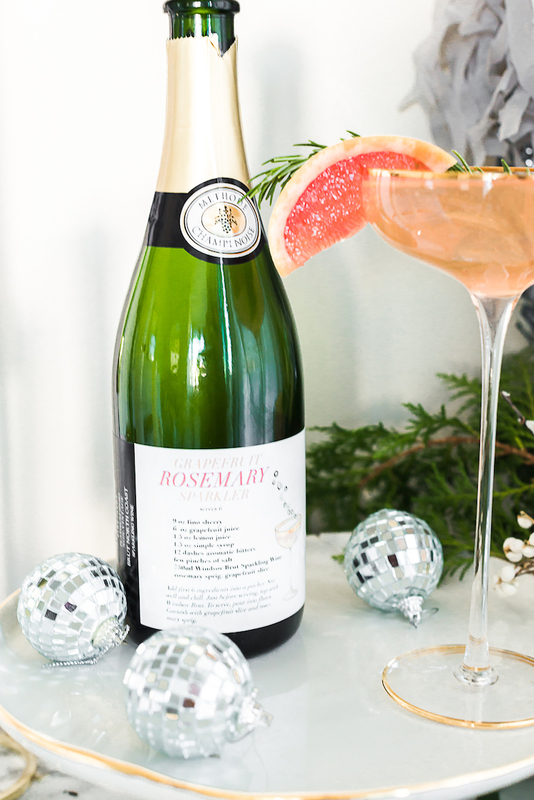 As a practical AND cute serving option for party guests, I had the recipe for the Grapefruit Rosemary Sparkler printed onto the label. 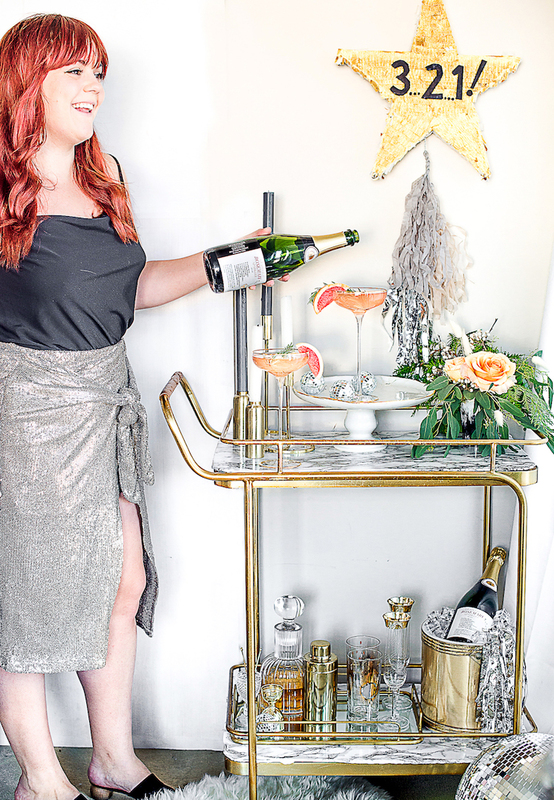 Even if you are not hosting your own NYE party, bringing a personalized bottle of sparkling as a gift will be an extremely special thank you to the host. And adding a recipe to the bottle is a gift that keeps on giving! 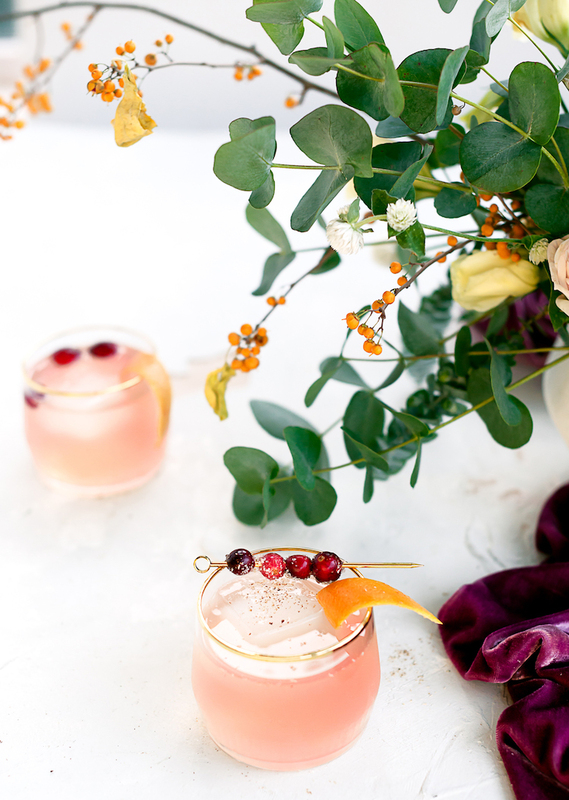 Your bestie or mom can pop open the bubbly and mix up your custom cocktail recipe and think of you. It’s also a great gift for someone who you may not know too well, you can never go wrong with a bottle of bubbly as a gift. 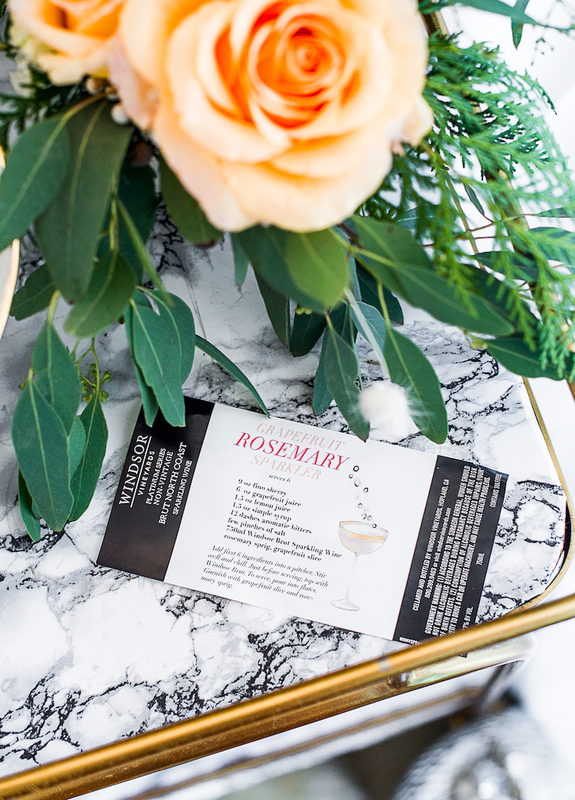 Giving one with a custom designed label with their name or a recipe made just for them will feel extra special and not like you picked up a hostess gift at the corner store on the way. Awkward. I always hate to bring wine to a party and then they feel obligated to open it right then. A customized bottle will encourage them to tuck the bottle away (or display it front and center on their bar!) for later to savor on their own time. Give the easy design tool on Windsor’s site a whirl to make your own labels! They have expert guidance and in-house design talent that allows them to help you create exceptional experiences and memories with one-of-a-kind signature wines. If you are looking to ring in the New Year with personalized wine, be sure to order by Tuesday, December 18, 2018 which is the New Year’s Eve ship deadline. And to help you ring in the New Year, I have a 15% discount code for you! Use code: ASHLEYR15 at checkout here! 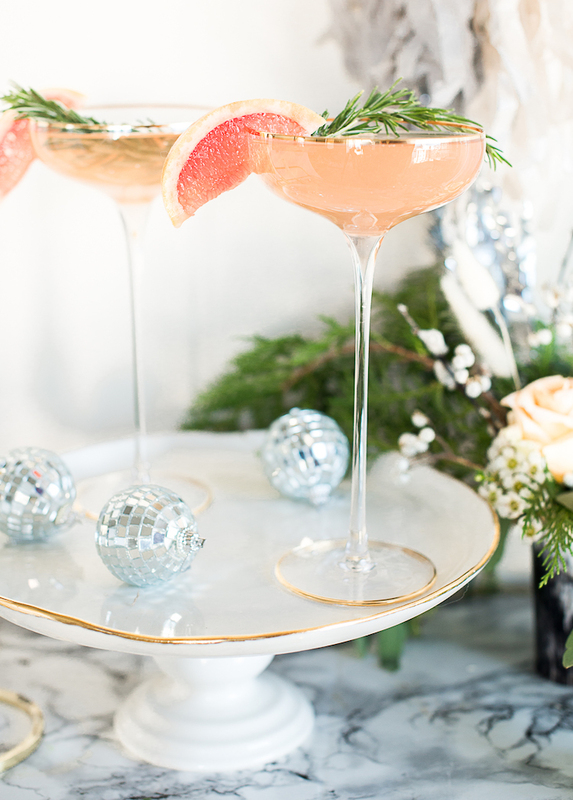 Wishing you and yours a happy, sparkling New Year! 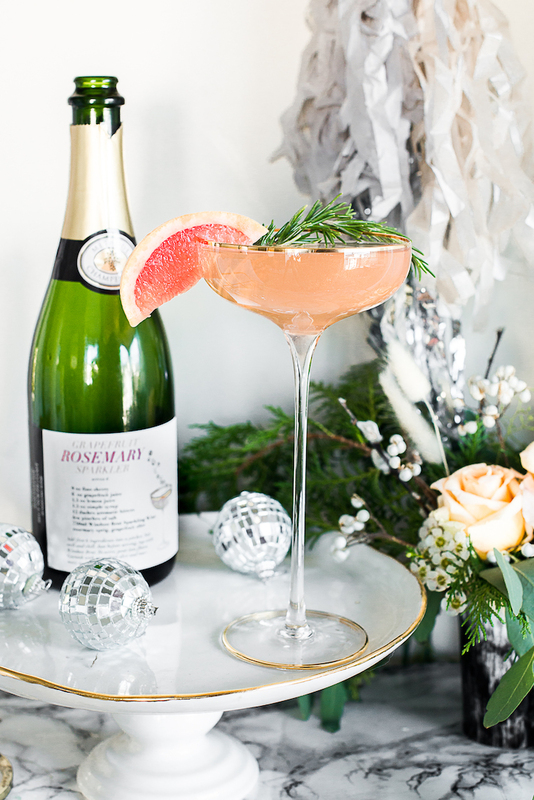 The post Grapefruit Rosemary Sparkler NYE Cocktail appeared first on Craft and Cocktails. 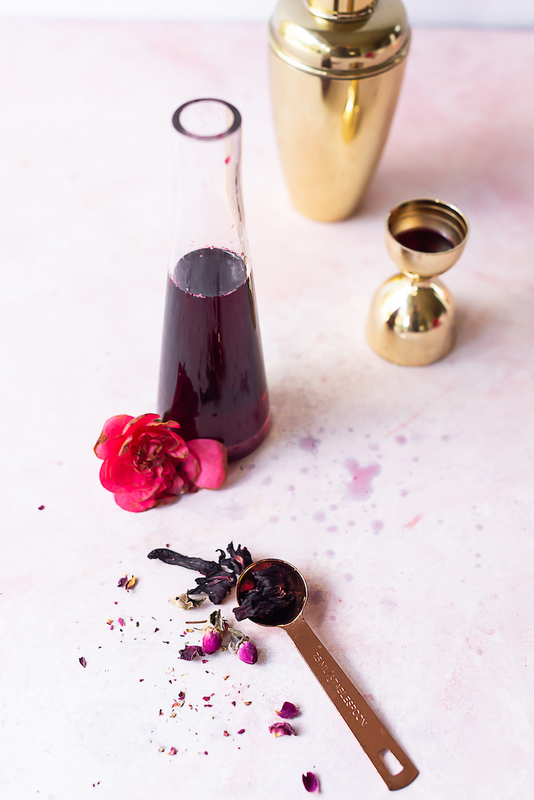 To Deseed and juice a pomegranate can seem like a daunting task, but I am here to let you know how to turn those beautiful jewels into beautiful juice! It’s rather simple actually and only requires a bowl, water, and something to muddle with. Seriously. 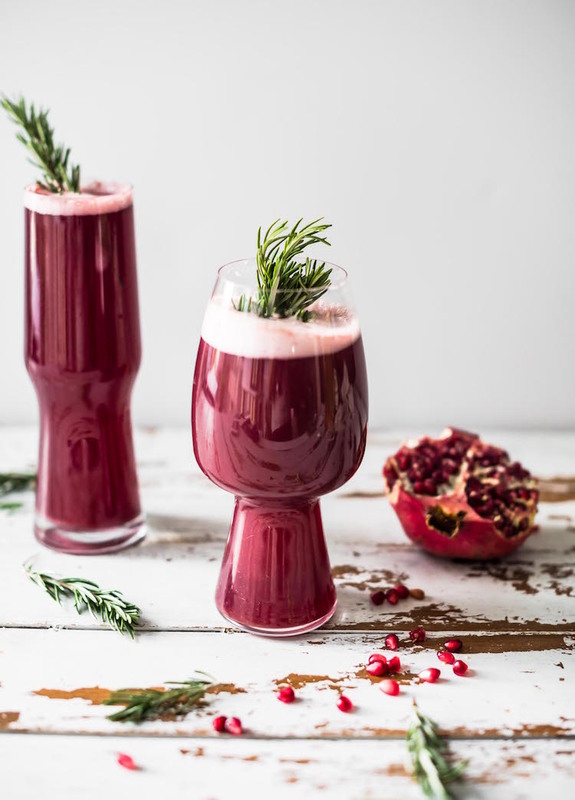 If this was click bait, the title would read “You have been juicing pomegranates all wrong,” but we don’t do that around here, we get right to the pint. 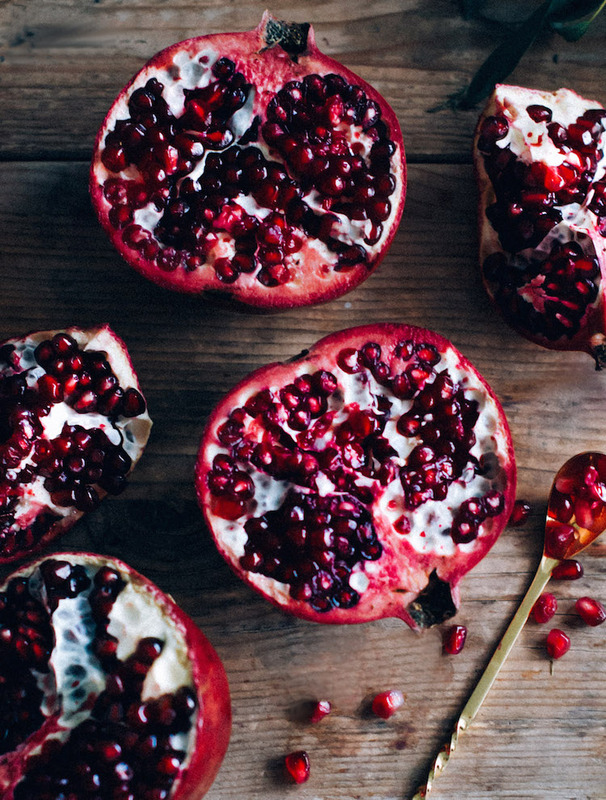 Here’s how to easily deseed and juice a pomegranate! Fill a large bowl 3/4 with water. Cut a pomegranate into quarters. In the bowl of water, start separating the seeds, I mean jewels, from the pith. The seeds will sink and the pith floats! This allows you to easily skim and discard the white part and leaves you with the tasty seeds after straining the water. For juice: Muddle the pomegranate and strain the juice (I find 1 large pomegranate yields a few ounces) into a jar and use with in a day or so for best flavor. You can also blend the seeds in blender for a few pulses and strain out the solids. 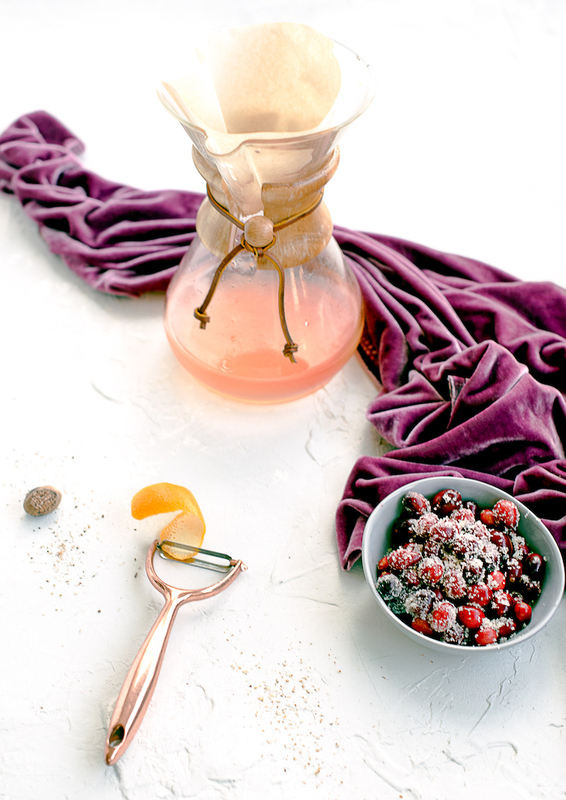 Et voilà, you have fresh, delicious pomegranate juice to enjoy in desserts, food and of course cocktails! 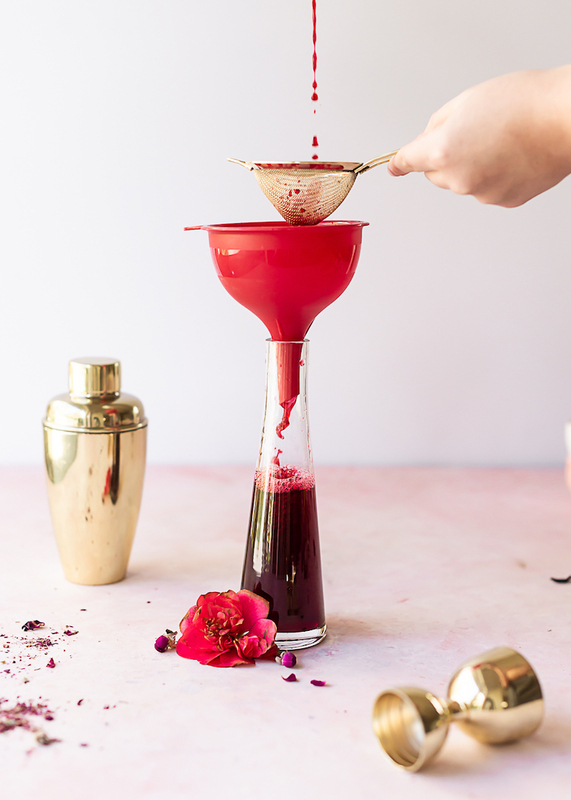 The post How to Easily Deseed and Juice a Pomegranate appeared first on Craft and Cocktails. Clarifying cocktails is not new around here. Well, on Craft & Cocktails anyway. If you are new here you may not quite know what clarified cocktails are, no worries here is a break down of the science behind the magic. We are heading to my best friends families home for Thanksgiving this year and on cocktail duty, naturally. 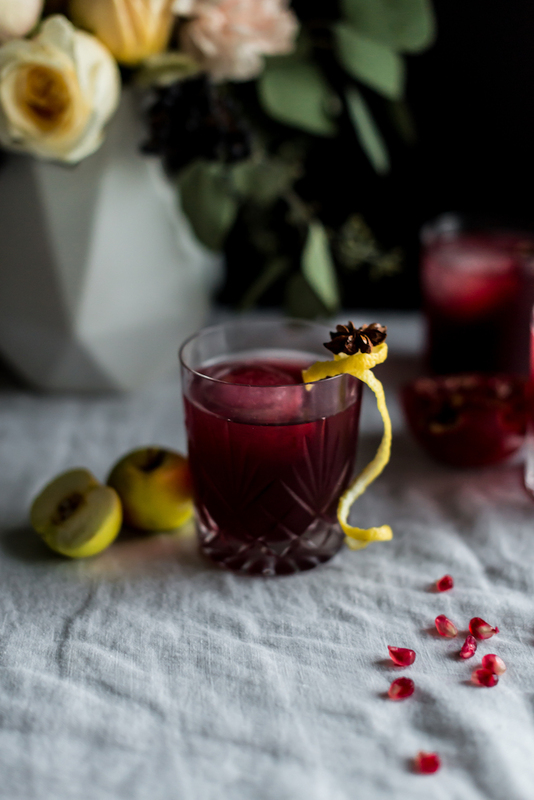 Along with cozy mulled wine, I am serving up this delicious Cranberry Spiced Clarified Milk Punch! I wanted to do batched cocktails ahead of time to make things easier day of as well as not be underfoot shaking cocktails in the kitchen as the meal is being prepped. It’s a mixed crowd as far as tastes go so I didn’t want to bring bitter, booze forward drinks like a Boulevardier or an Old Fashioned. These are easy to batch of course because they are all booze and can actually sit around for a long time in jar in your bar. I wanted a citrus and cranberry drink which normally should be made either right before or shaken a la minute to preserve the fresh juice flavor. In these cases, I turn to clarifying, a.k.a. milk washing, the cocktail. Clarifying does make a drink more clear, sometimes making it crystal clear, but it also helps preserve the cocktail. Clarifying can also be done with gelatin, agar agar and a centrifuge, but who has one just laying around (although I wouldn’t mind adding this tool to my homebar…) Although they are all different methods, they have the same purpose: removing the insoluble particles. 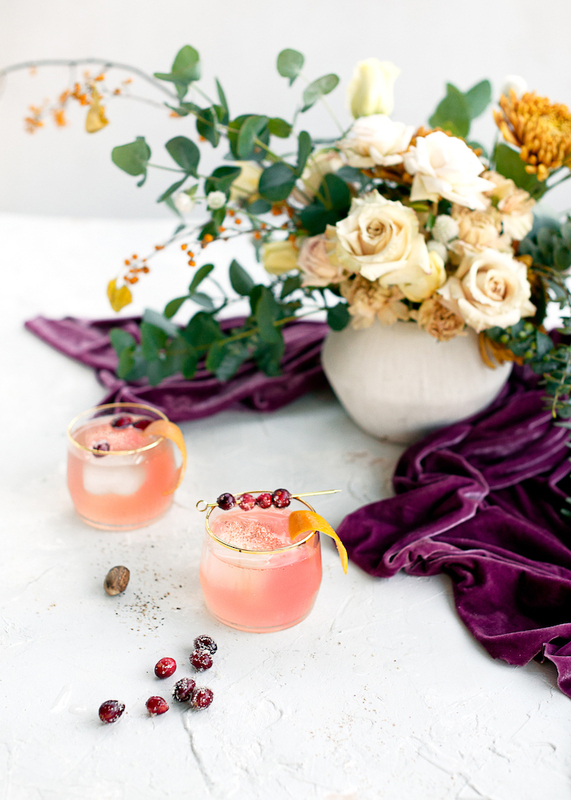 Because of this, the cocktails can be preserved for a long period of time stored in the fridge even thought they have citrus. I like the protein/milk clarification which gives the cocktails a silkier, more round mouth feel. 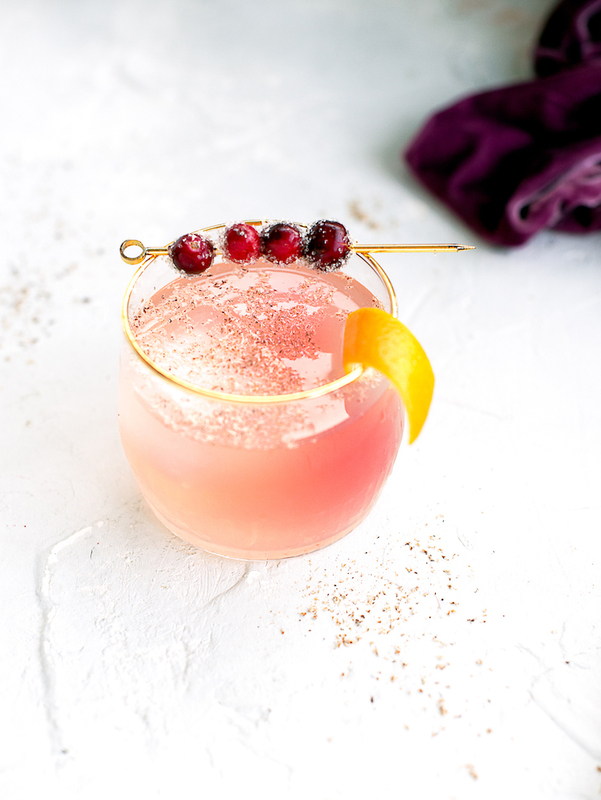 Along with cranberry, spices, and citrus, I added in Velvet Falernum. Classically in tiki drinks, this sugar cane based liqueur is a great fit in many drinks. 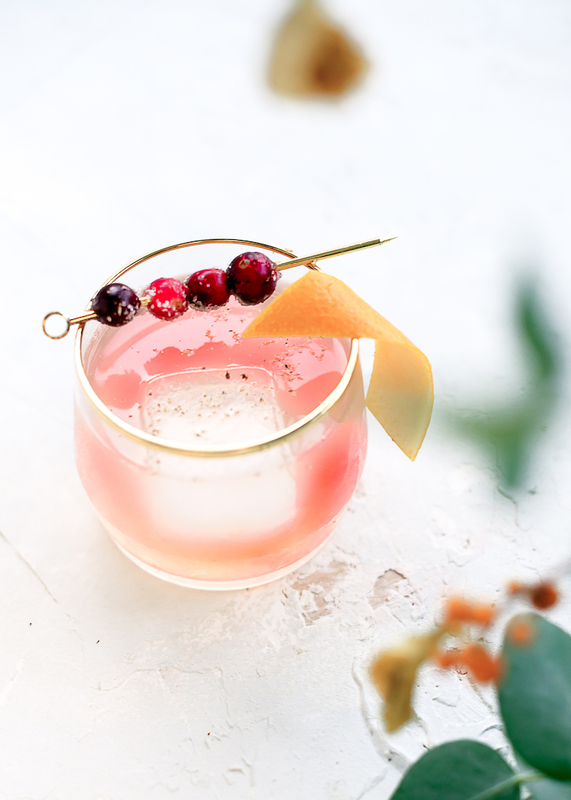 Flavors of Clove, lime, ginger and occasionally almond dance through each sip of falernum. Clearly a perfect liqueur for fall and winer cocktails as it has been for summer tipples. 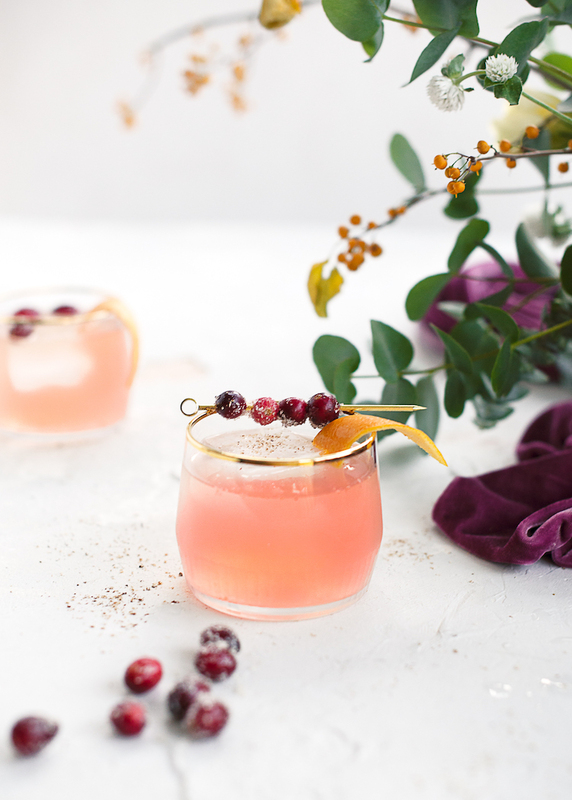 In this Cranberry Spice Clarified Milk Punch, it is the perfect match for the baking spices and bourbon to serve at your holiday gatherings. Make big batches ahead of the holidays, and you can pull out a pitcher ready to serve for unexpected guests and impromptu merriment for you! 1. Peel 5 lemons, reserving fruit for juicing. Add bourbon, velvet, falernum, lemon peels, cinnamon sticks, and star anise to a container. Let infuse for a few hours. Strain out solids. 2. Add cranberry syrup, juices, and water to the infused booze mixture and stir. 3. In a non-reactive container, add the cold milk. Slowly pour in the cocktail into the milk. Stir. Let set for a few hours in the fridge to let the milk (a.k.a. curdle) do not stir, let it sit. 4. When the wheys have formed into a “web” in the container and settle to the bottom, it’s time to strain. You can leave it for up to 24 hours. 5. 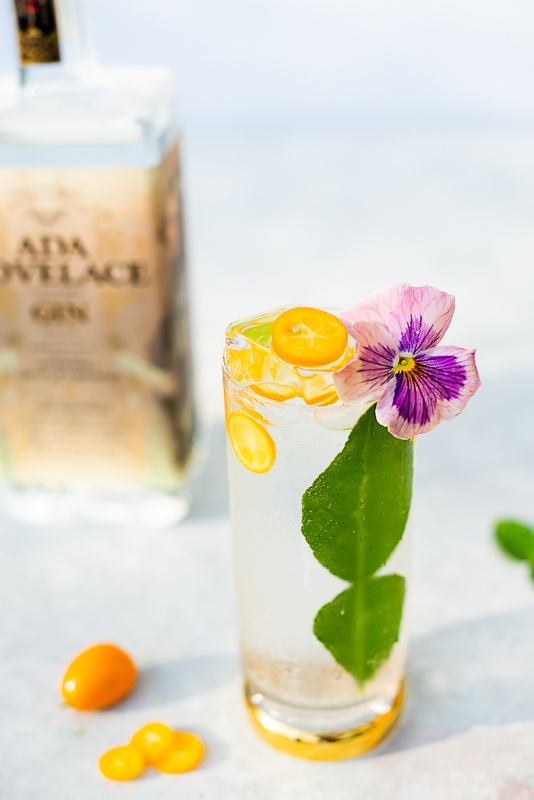 To serve: Pour into a glass with a large ice cube, grate of nutmeg on top twist of an orange peel. A a skewer of sugared cranberries is optional. 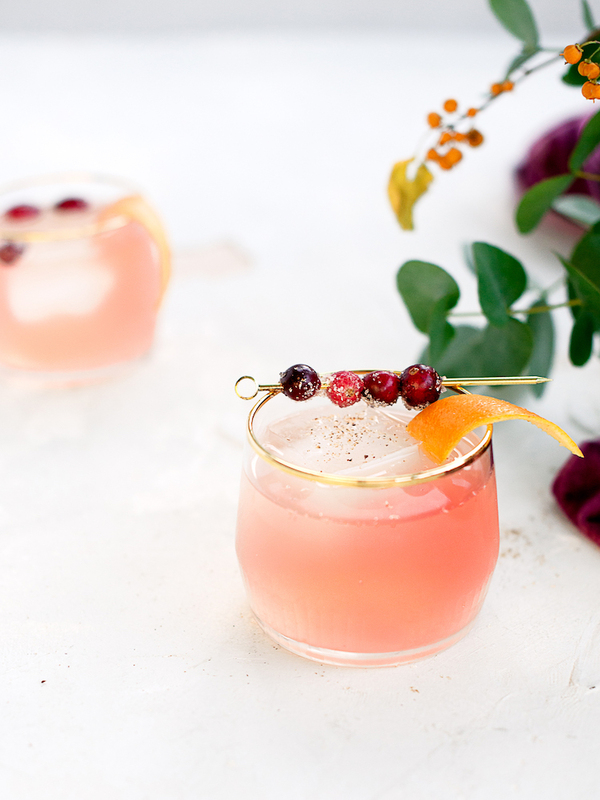 The post Cranberry Spiced Clarified Milk Punch appeared first on Craft and Cocktails. 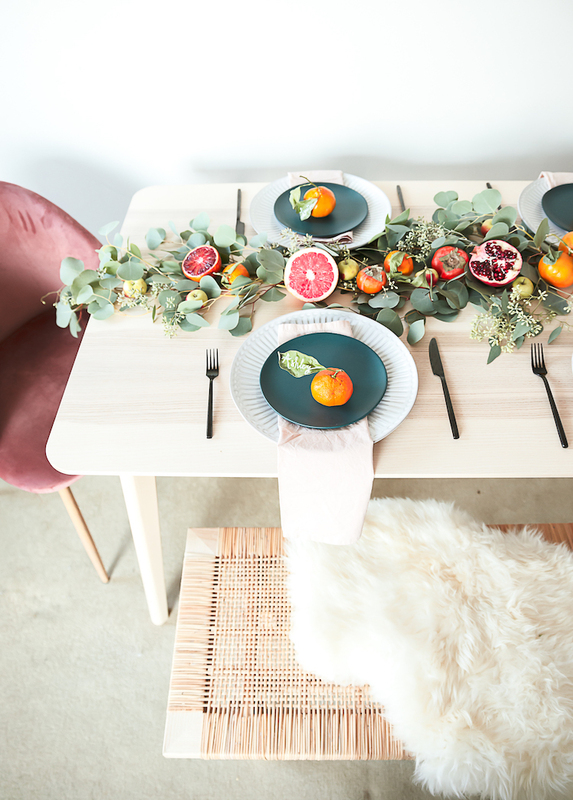 Setting the perfect table to highlight the Thanksgiving feast can be a tad stressful. Do you go formal or casual? Linens, no linens? Place cards or no? One year I hosted 16 people and along with a the turkey, sides, and drinks, I also made clay place card holders and multiple flower arrangements DAY OF. Never again! I have decided to lighten my load since then. No one wants a stressball host. Besides, it’s the conversation (and the drinks!) that matter most. 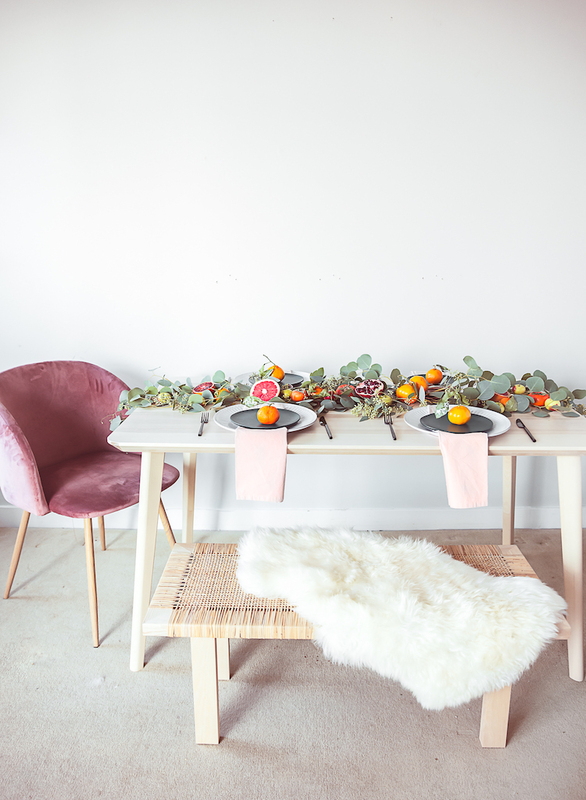 If like me, some florals are still a must for your table, take a load off by having a local florist make some arrangements or if you still want a personal touch on the table, put together this easy affordable floral centerpiece! I made this centerpiece for about $20-$30 from the grocery store! AND it only took me 10 minutes to put together. Really. A few things from the floral department and produce section will give you everything you need for this. Traditional garlands are beautiful, but can be expensive or time consuming to make tying all of the stems together with wire. 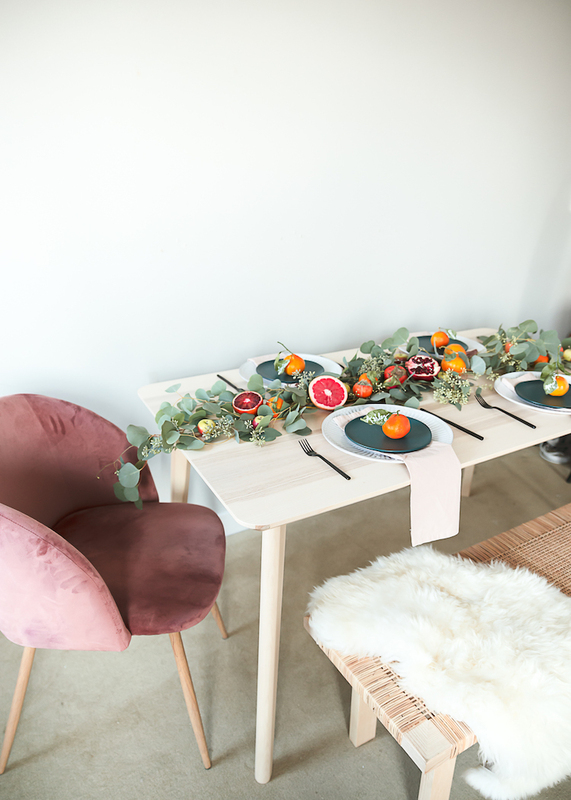 If you are going to be needing to move this around easily though, it’s not the best route as it is laid down on the table, but if you are leaving it on the table for the whole party or meal, this will do just fine! I grabbed everything from Whole Foods, but many local grocery stores should carry these. 3-4 packs of greens like branches or eucalyptus. 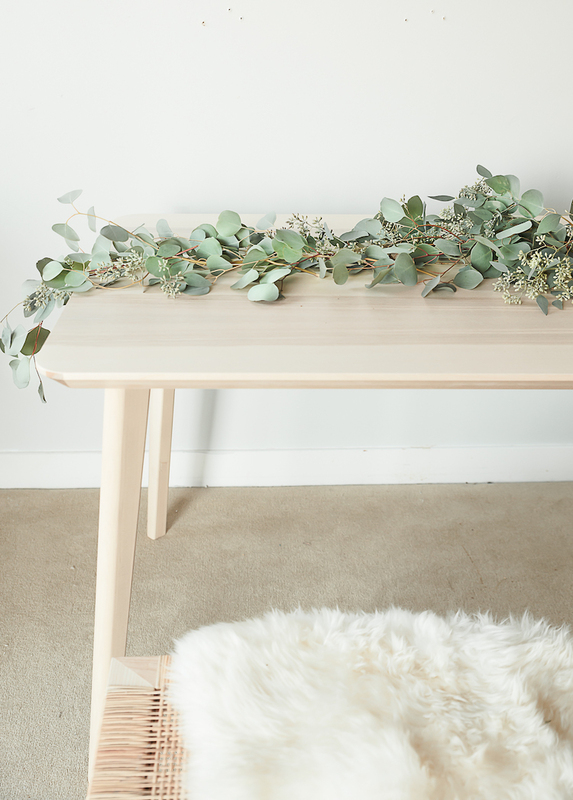 I picked up 2 packs of silver dollar eucalyptus and one pack of seeded eucalyptus to fill the length of the table. 1. Starting at one end of the table lay down the first branch in the middle of the table, I started with a pointed silver dollar eucalyptus. 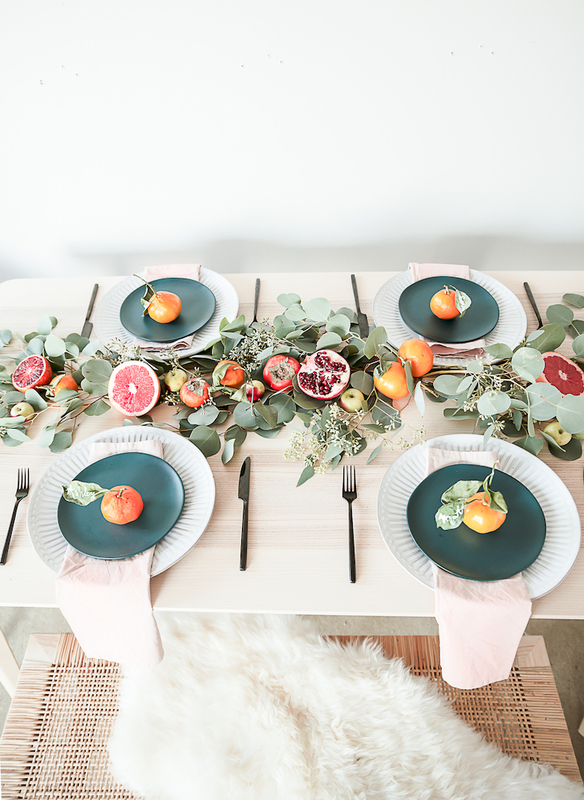 Lay it down with the greenery facing away from the center of the table. Take the next branch and lay it down in the same direction, over lapping the first one, hiding any branch with the greens. Continue this to the middle of the table. 2. Now from the other end of the table, repeat laying down the branches, meeting the other side in the middle. I then took my seeded eucalyptus and tucked them into the other branches randomly to give it a fuller look. 3. 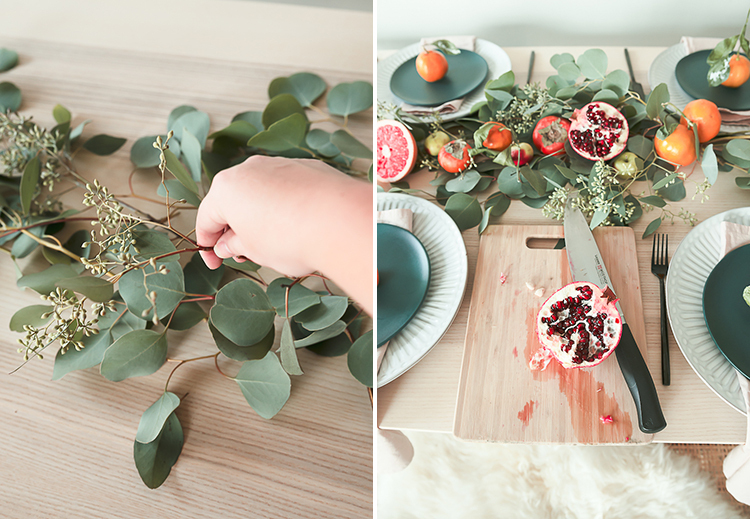 Cut the pomegranate, grapefruit, and blood oranges in half. Leave the other fruits whole as they will brown quickly and will not look great on the table. 4. 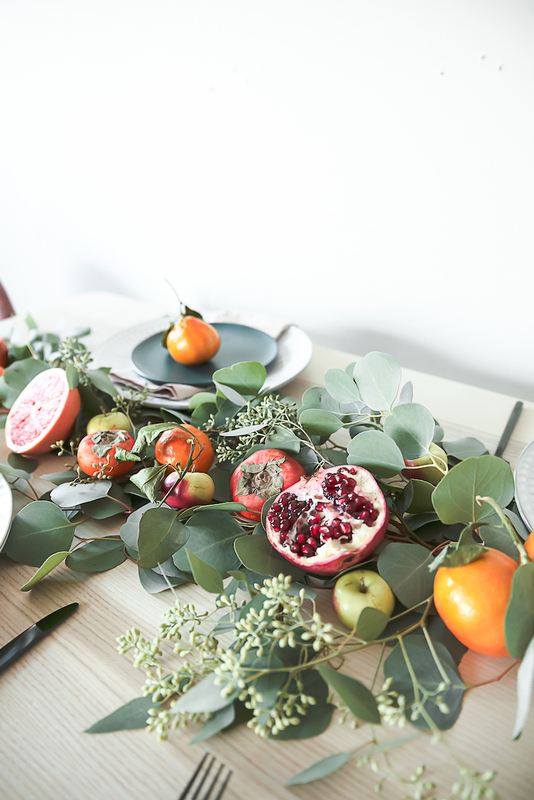 Place the fruit along the branches sporadically, spacing out the same fruit. I start with the larger fruit like the pomegranate and lay that first, then fill in with smaller fruit like persimmons and apples. 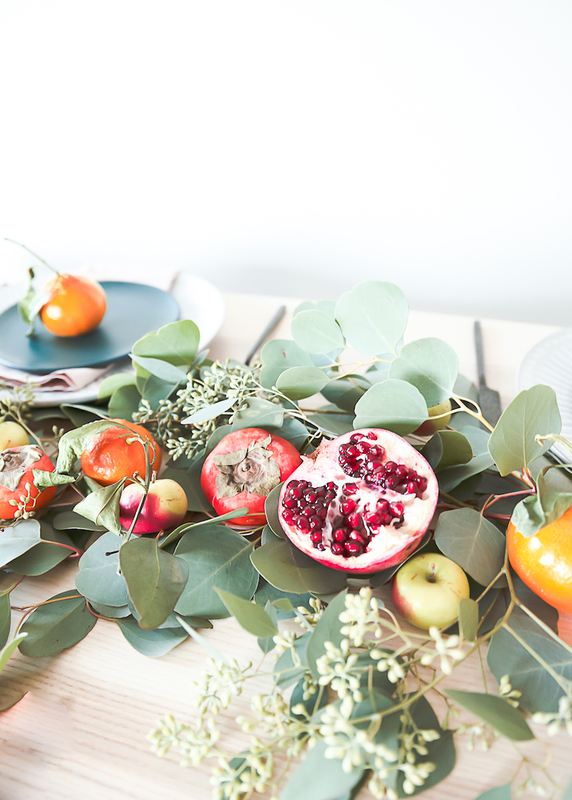 The post Easy Affordable Floral Centerpiece for Thanksgiving appeared first on Craft and Cocktails. 1.Add apple brandy, simple syrup, lemon, apple, orange, star anise and cinnamon stick into a pitcher. Let infuse for a few hours or overnight. 2. Add prosecco and stir. 3. To serve: blend ground cinnamon and sugar on a plate. Run a lemon along the rim of the glasses. Rim the glasses with the sugar. Add ice to glasses and pour sangria in. 4. Garnish with cinnamon stick. Light the cinnamon stick on fire and blow out right before serving. 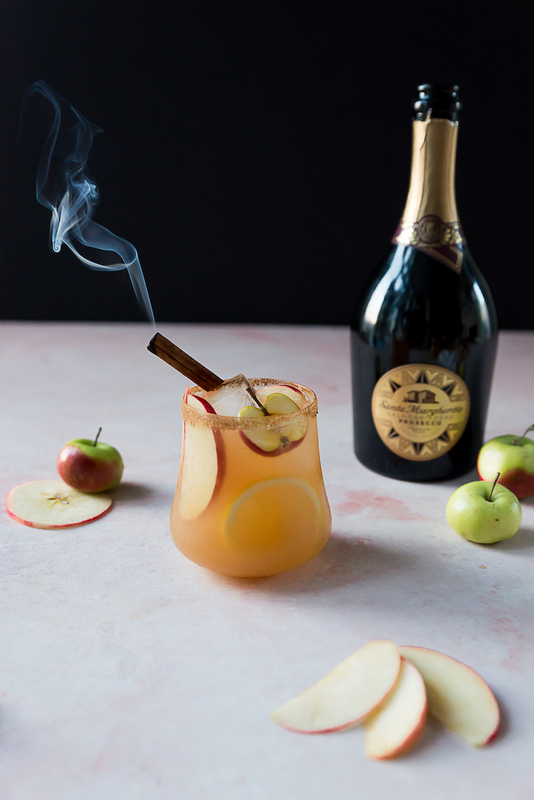 The post Smoked Cinnamon Apple Sparkling Sangria appeared first on Craft and Cocktails.